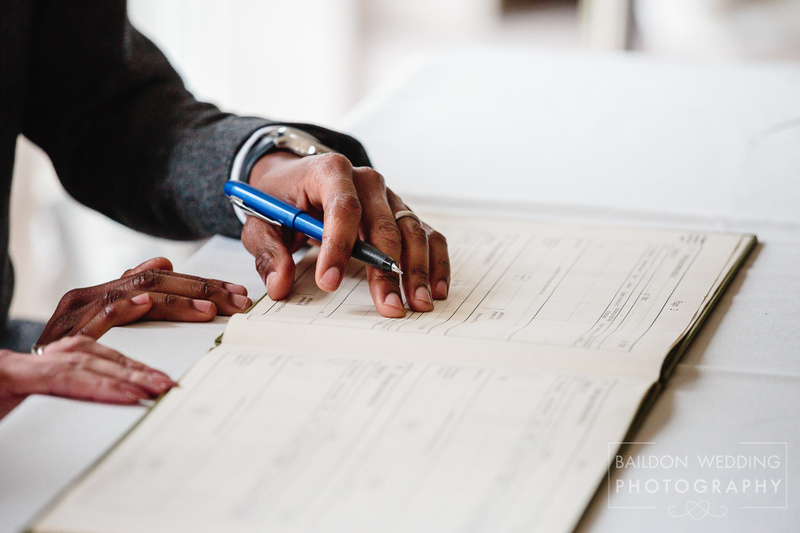 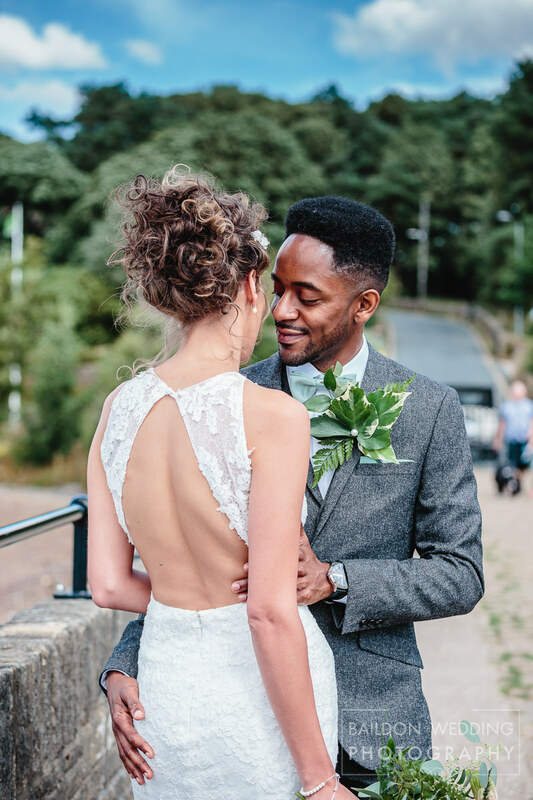 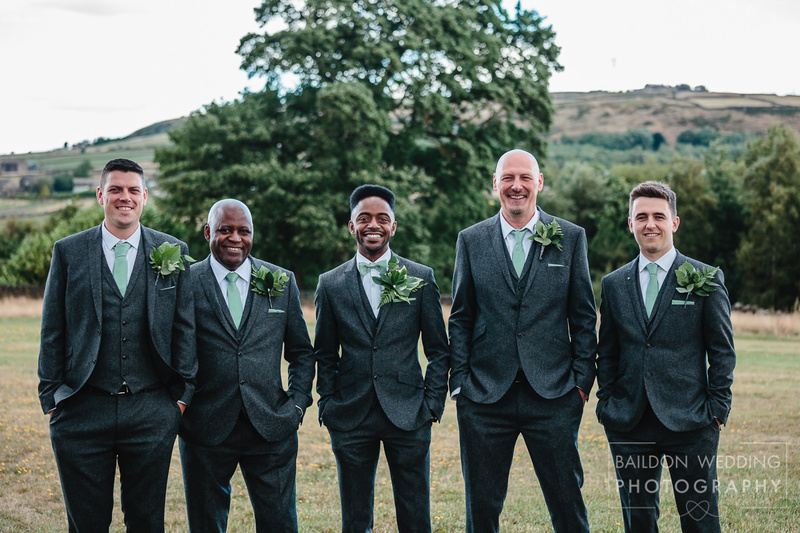 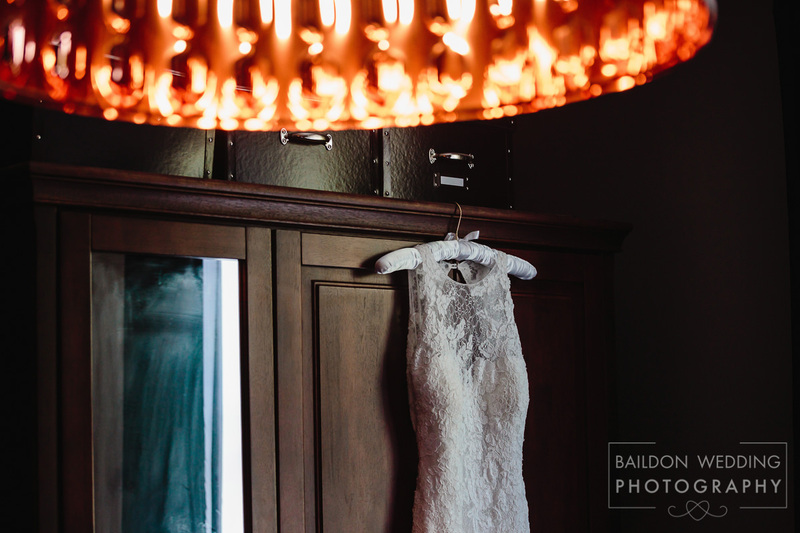 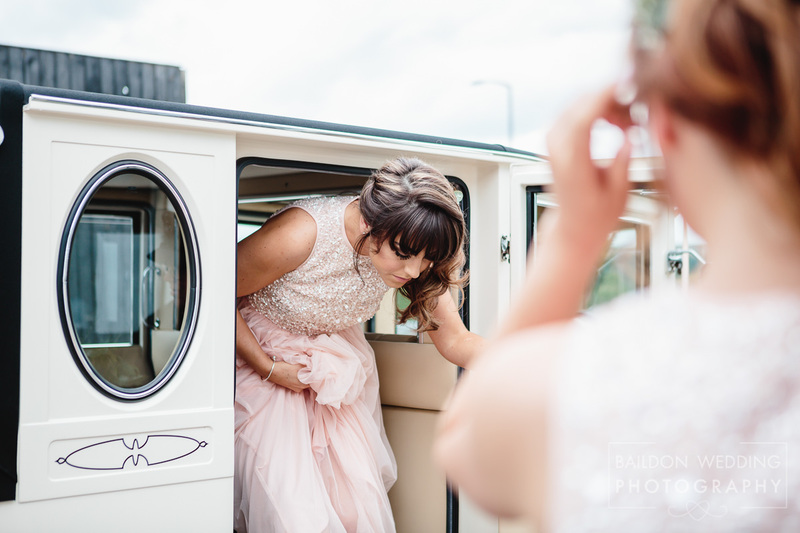 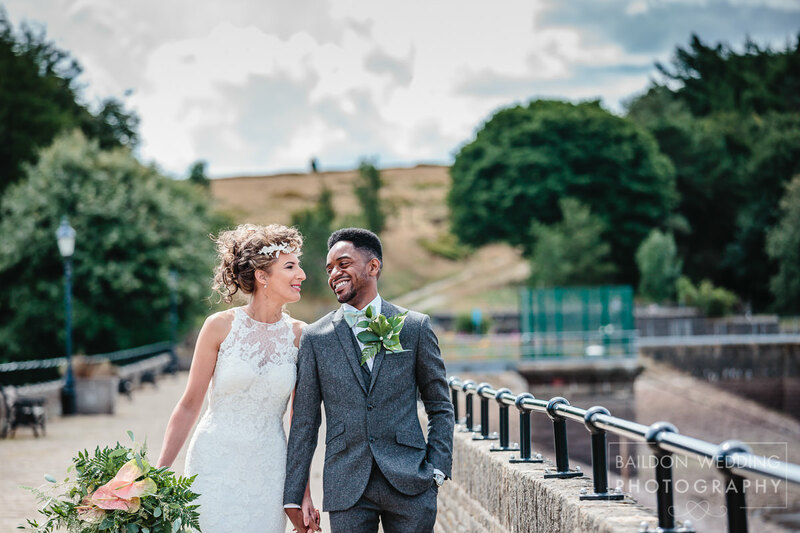 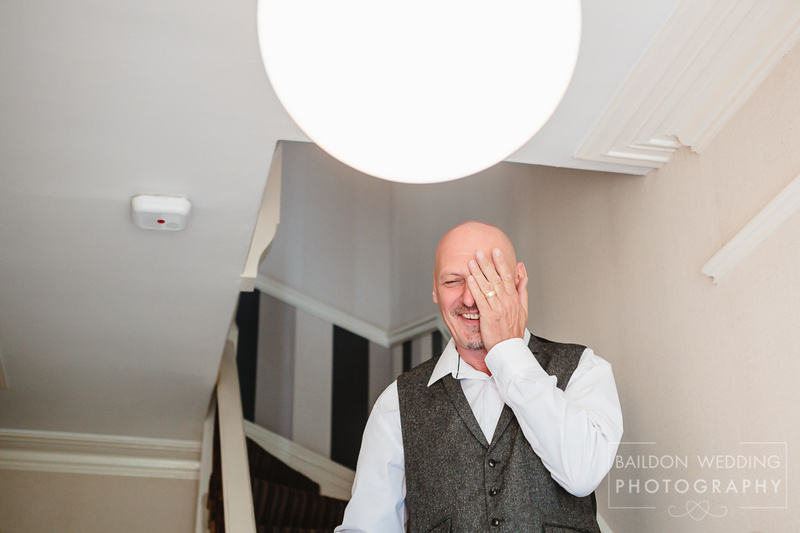 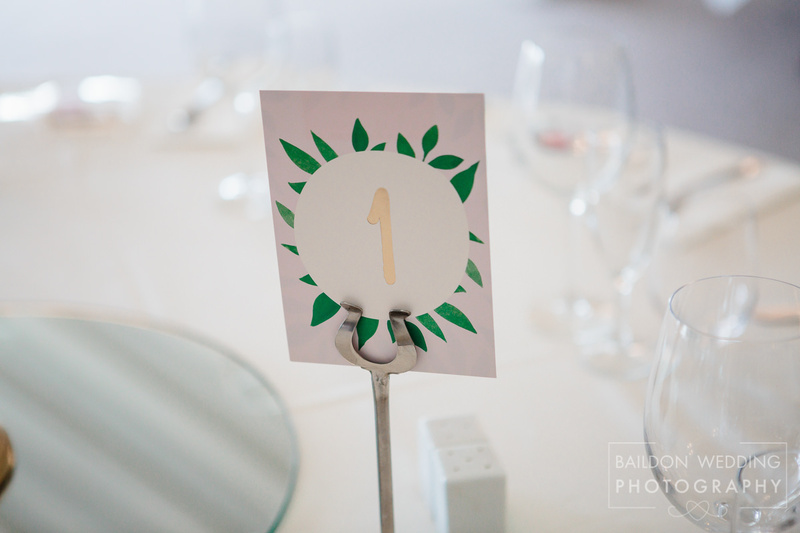 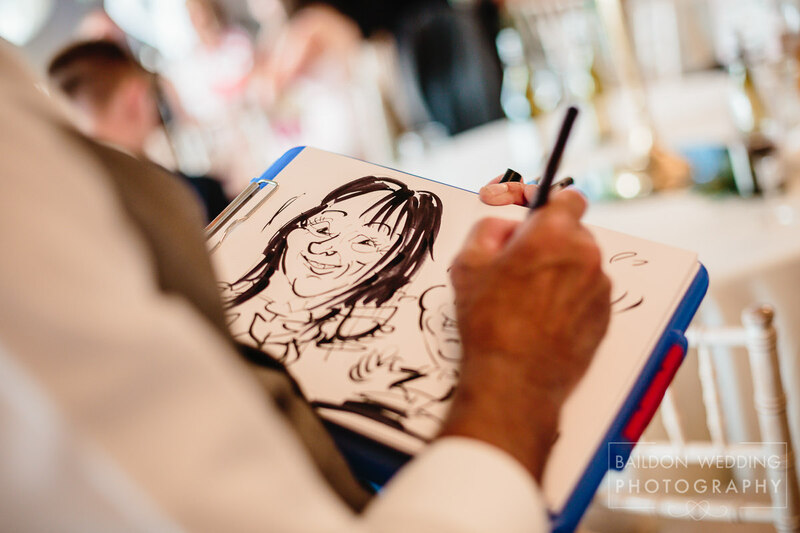 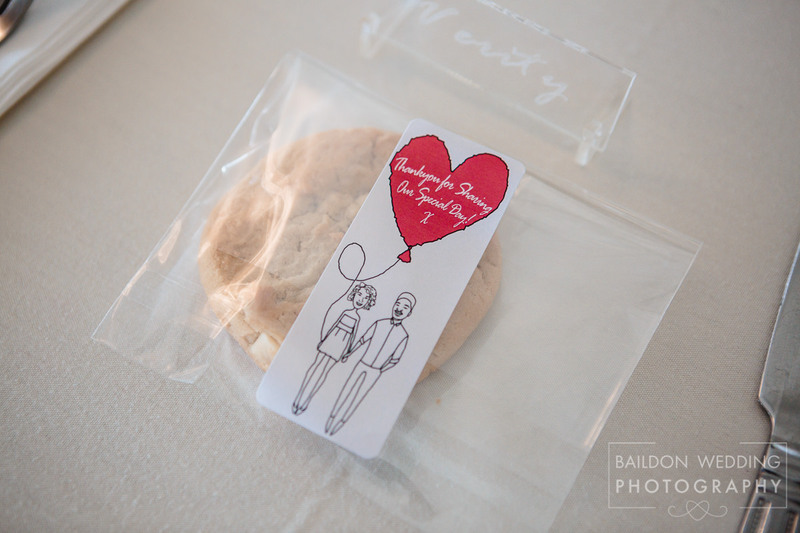 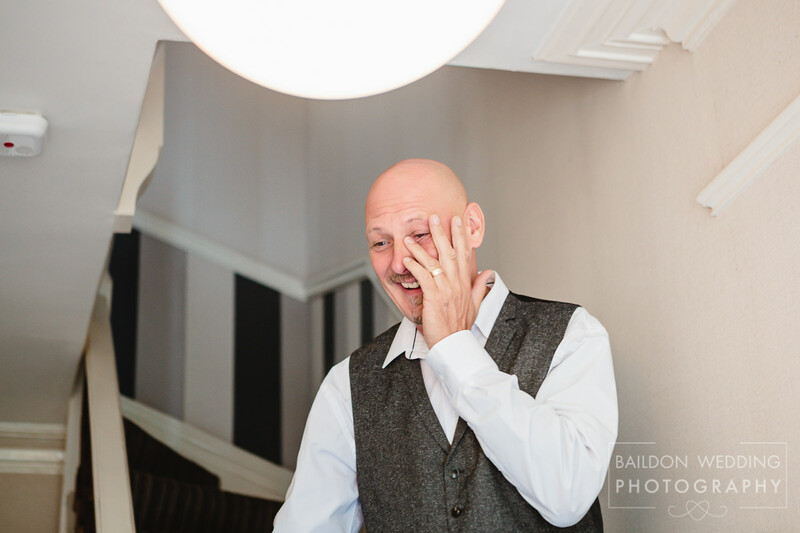 I was so excited when Rachael and William asked me to photograph their Moorlands Inn Halifax wedding. 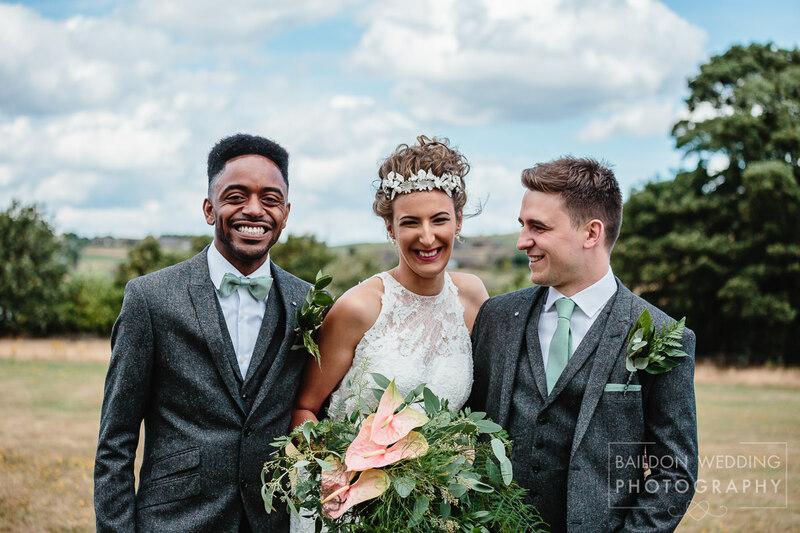 I met the couple when Rachael was a bridesmaid (with an impressive speech/rap) at her sister’s wedding three years before. 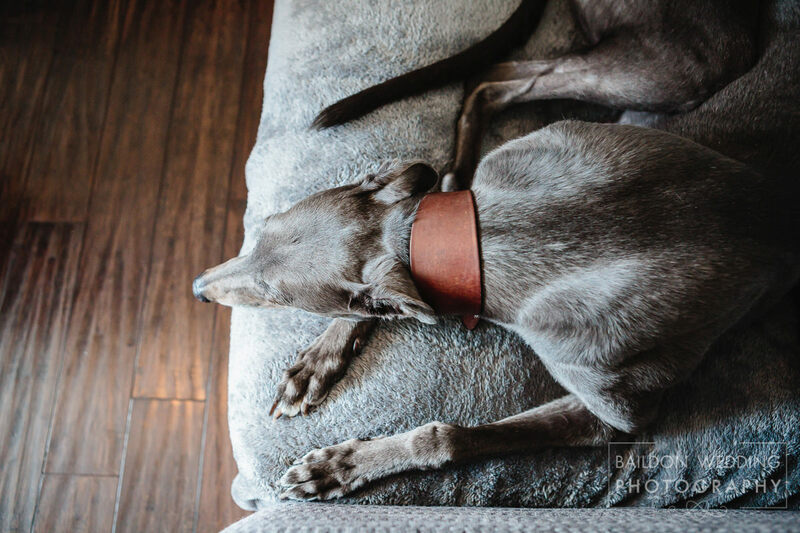 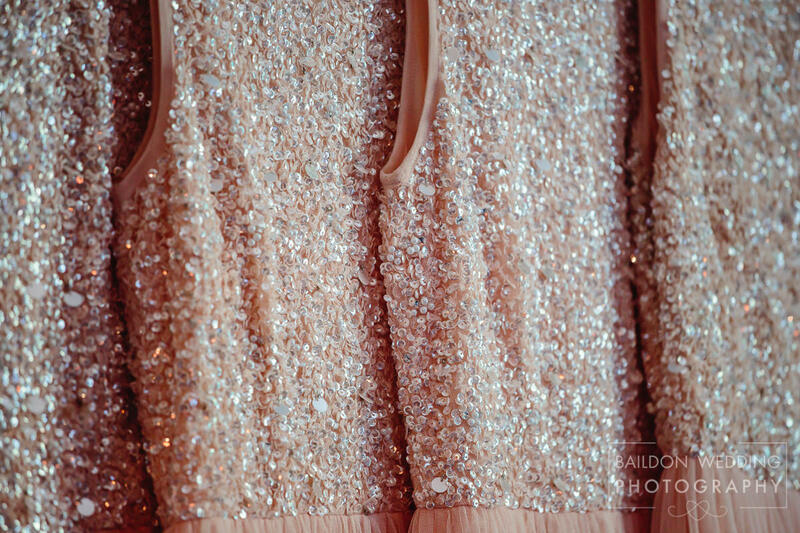 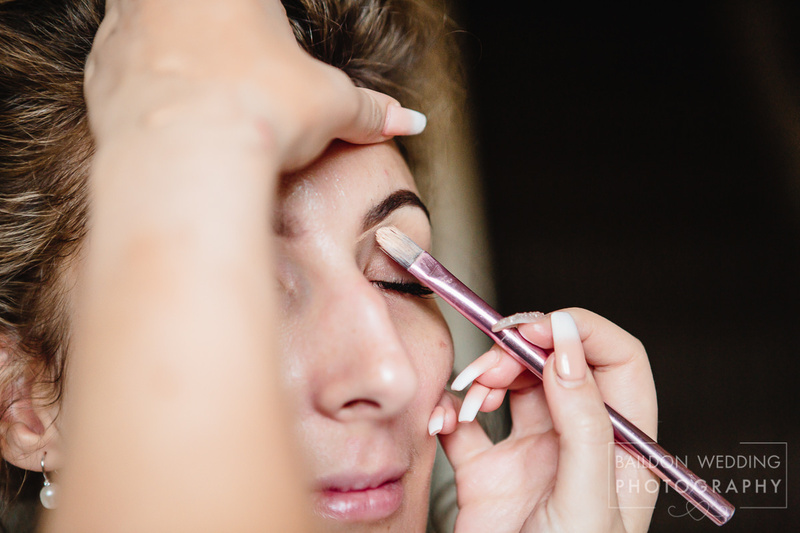 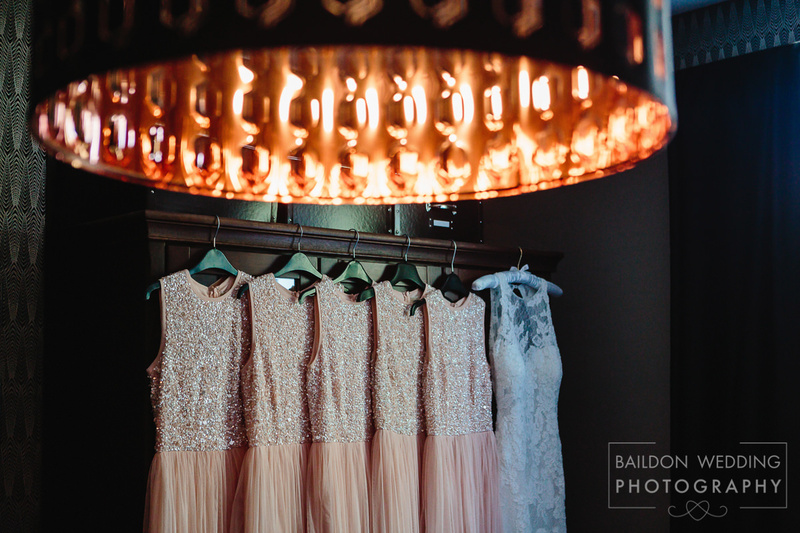 The day started with bridal prep at the couple’s home with Rachael’s bridesmaids and parents. 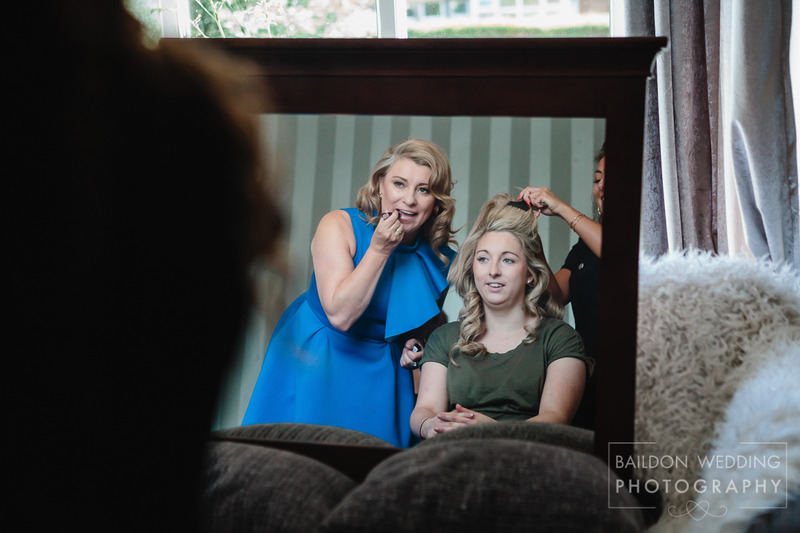 Jess and Abby from The Looking Glass Hair and Beauty did the hair and makeup. 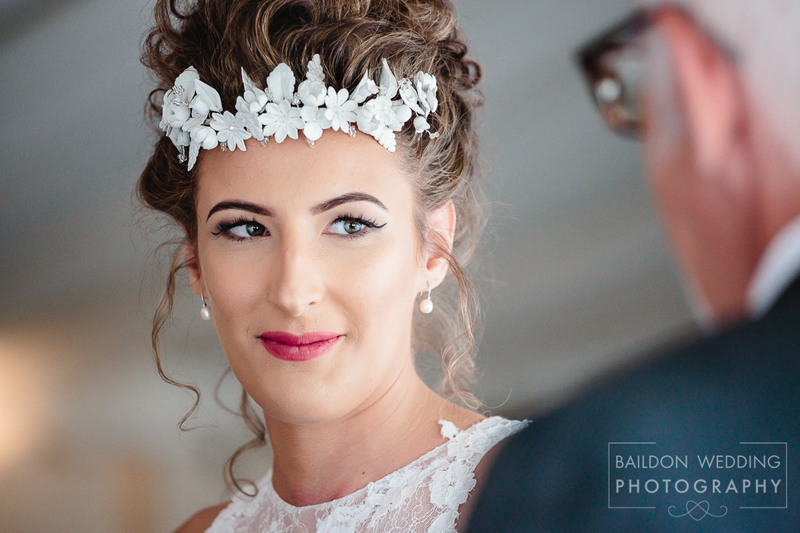 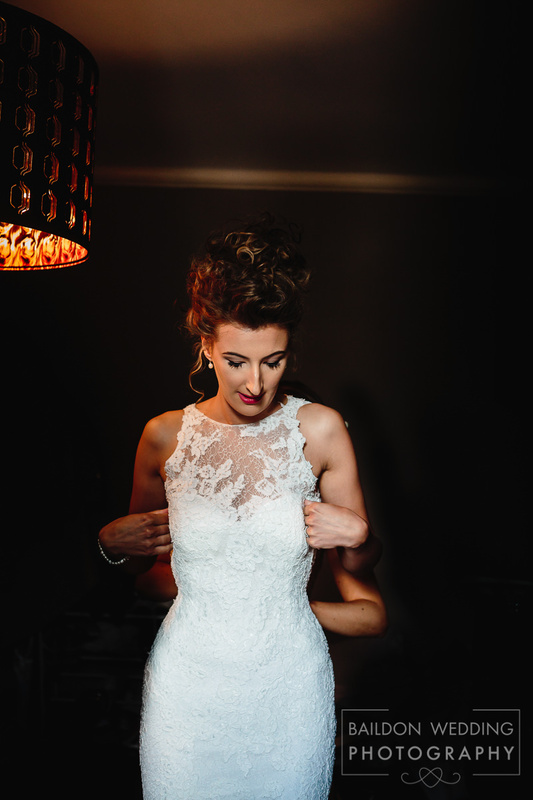 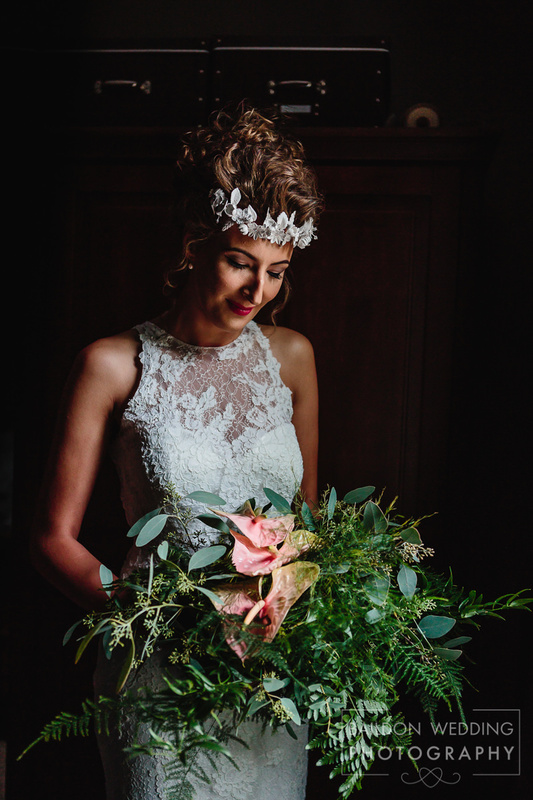 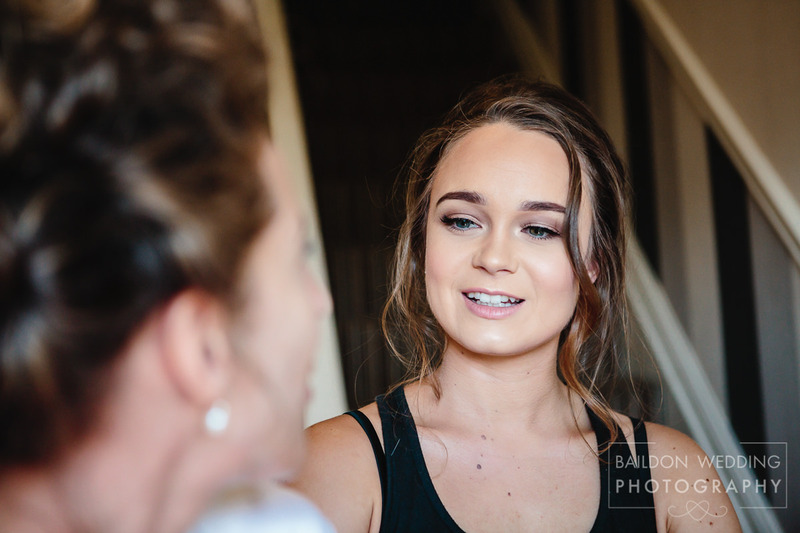 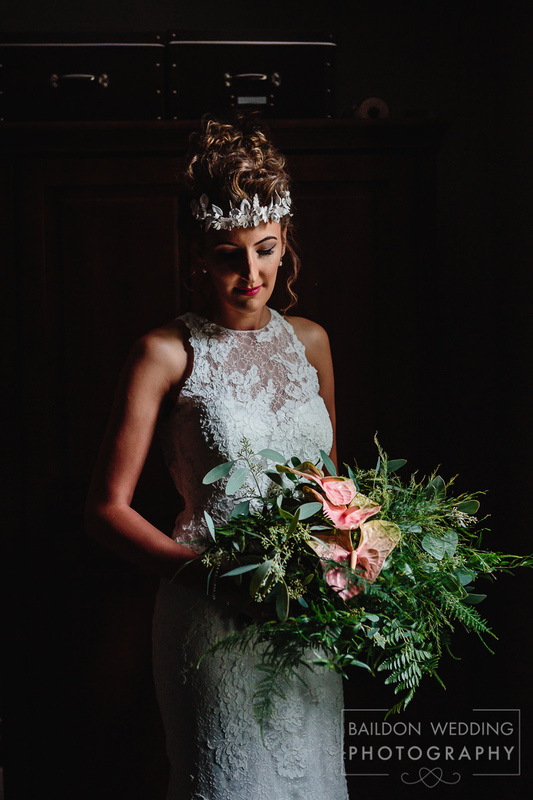 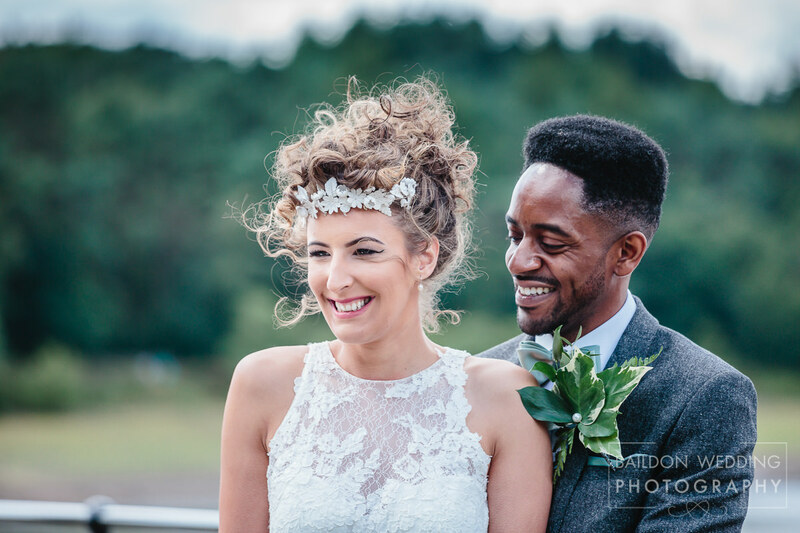 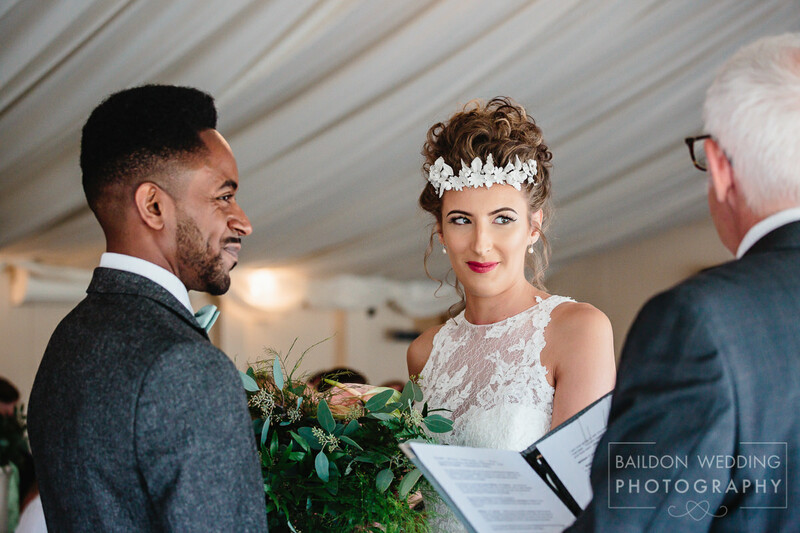 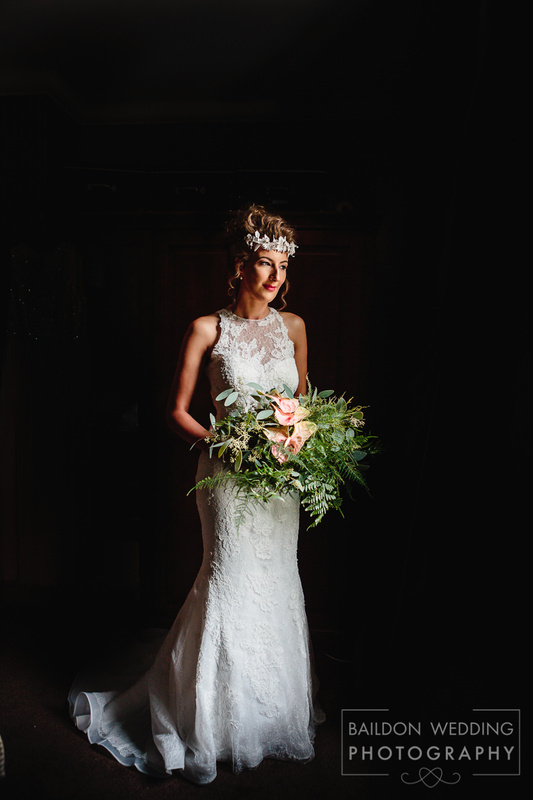 Rachael is very creative making her own bridal headpiece, which looked great in her curly hair. 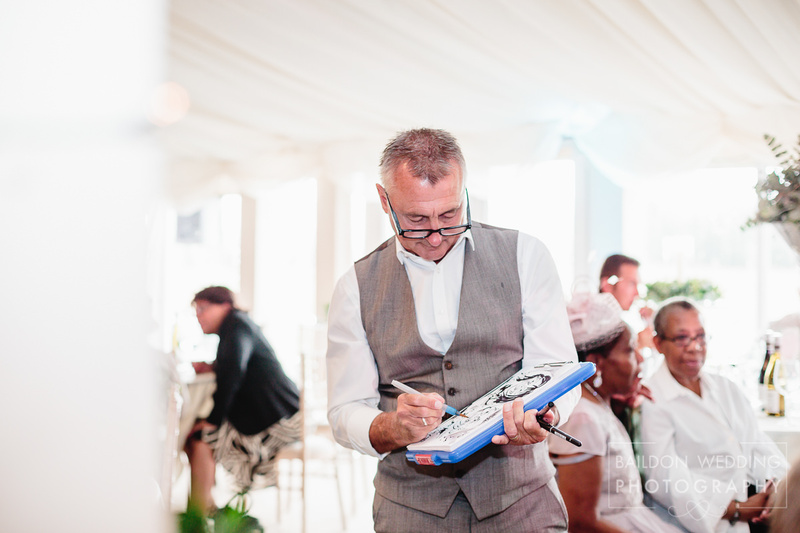 This was my first visit to The Moorlands Inn marquee. 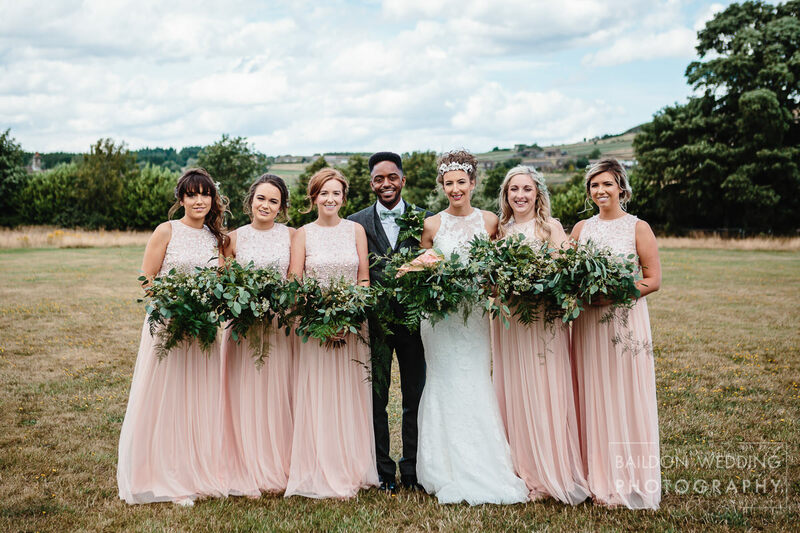 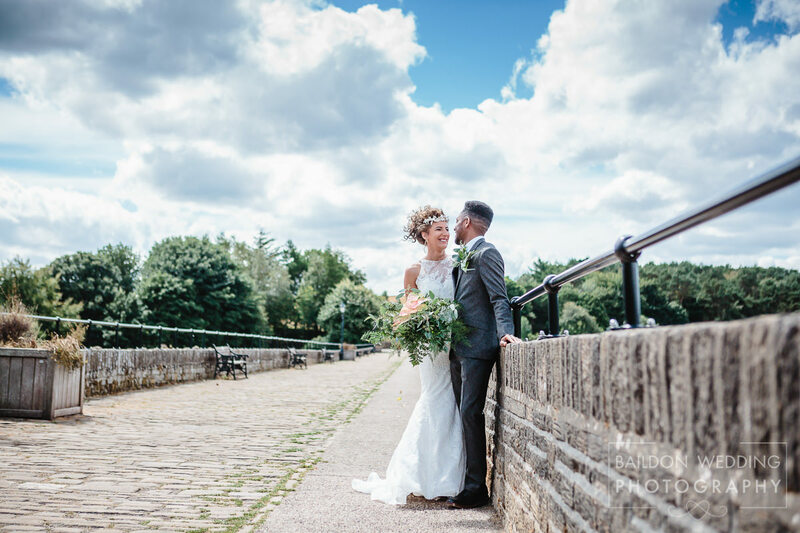 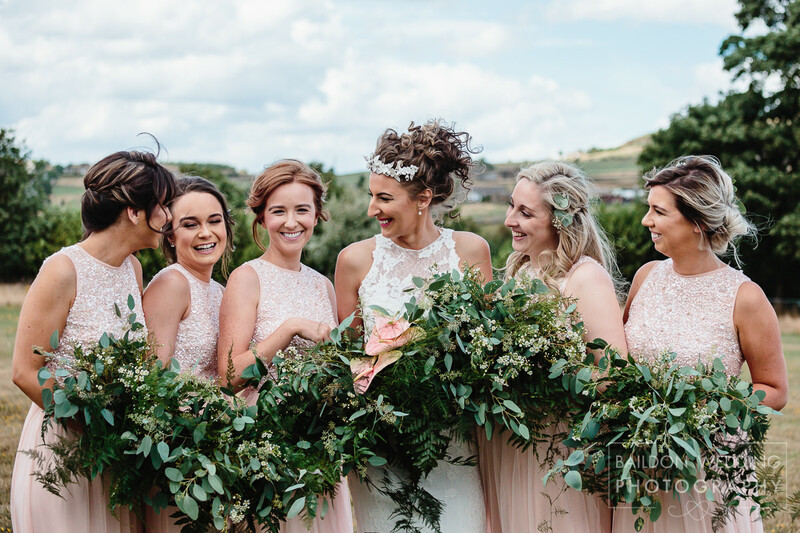 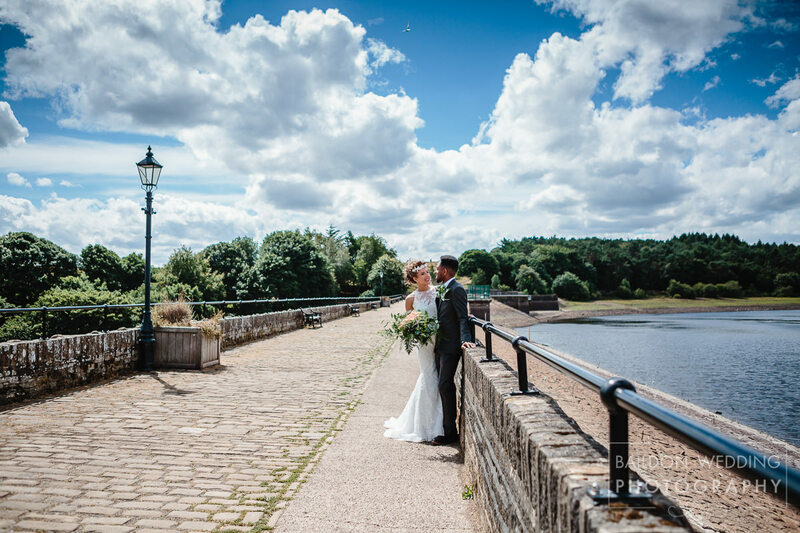 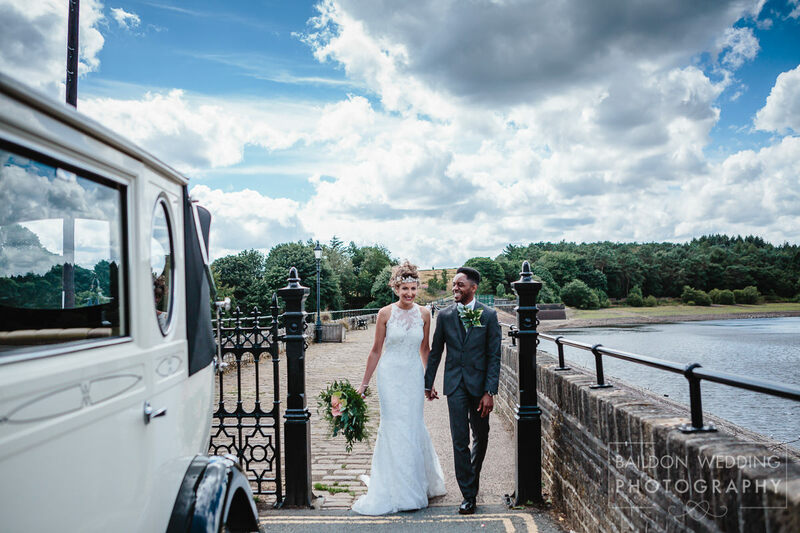 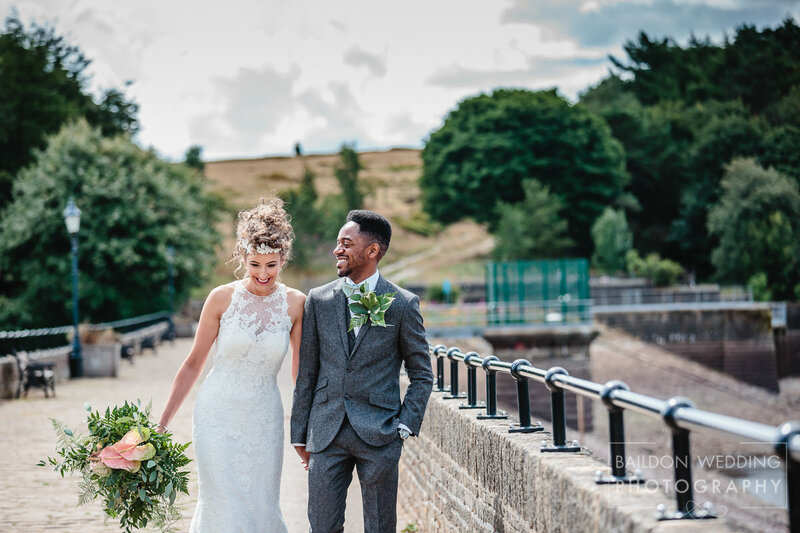 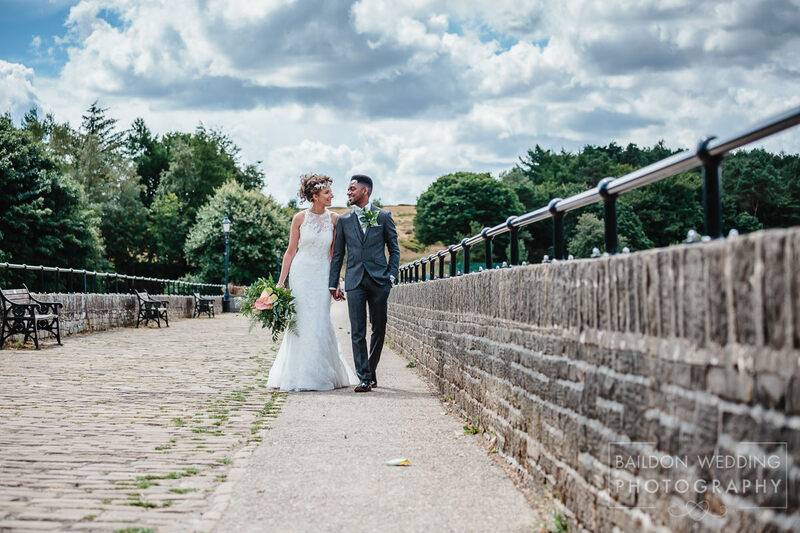 It’s a vast wedding venue that can seat up to 200, with a backdrop of the beautiful Yorkshire countryside. 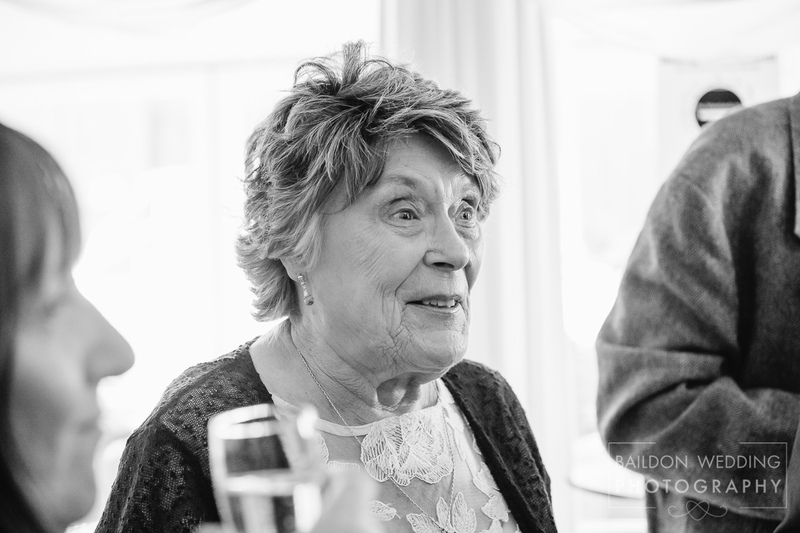 Bridesmaid Pip’s mum, provided her floristry skills for the happy couple. 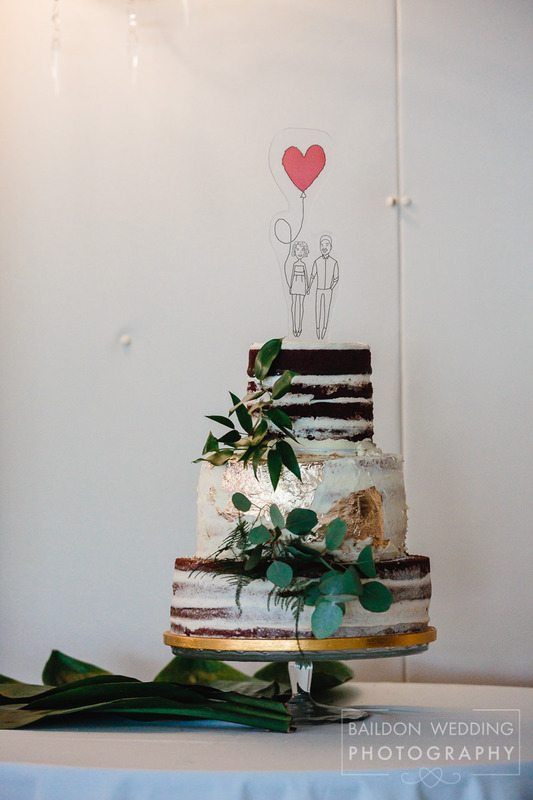 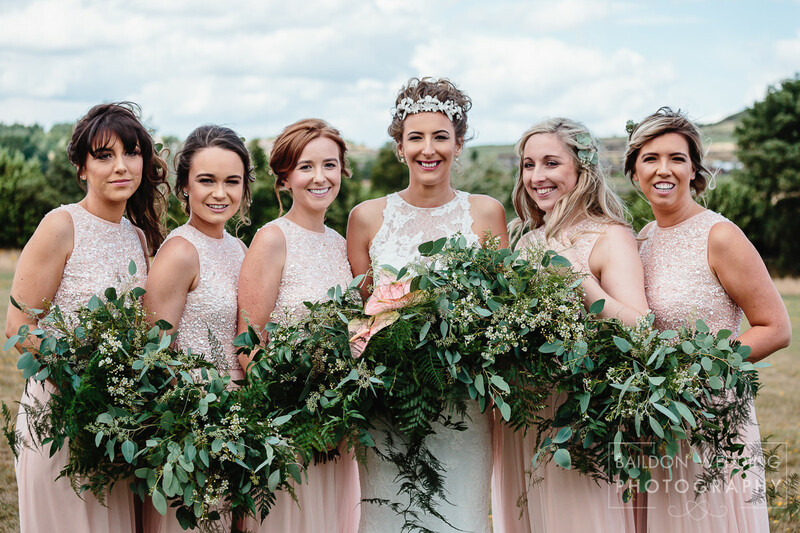 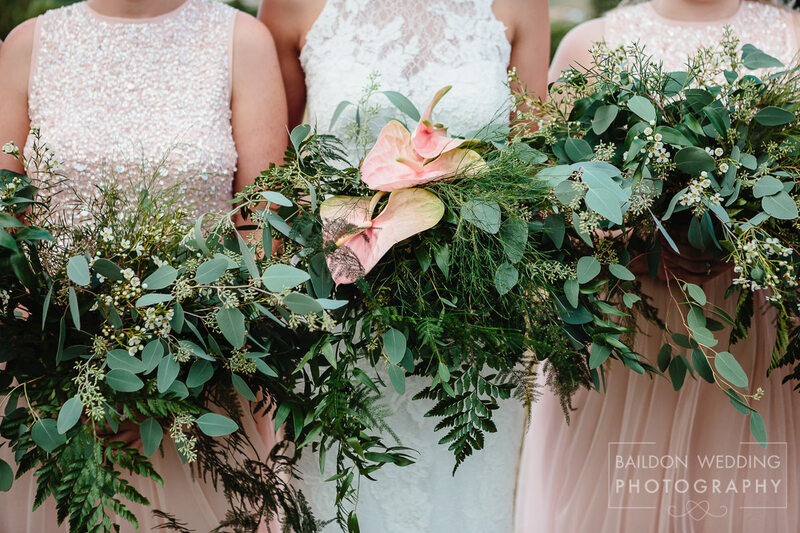 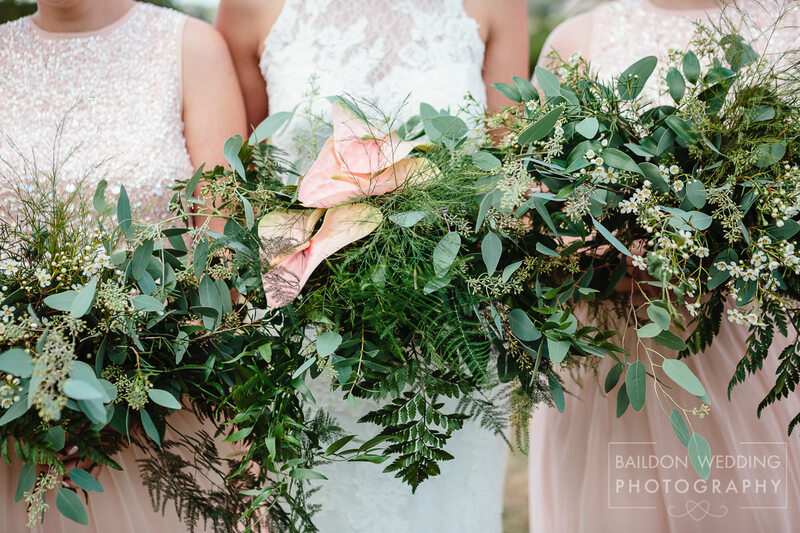 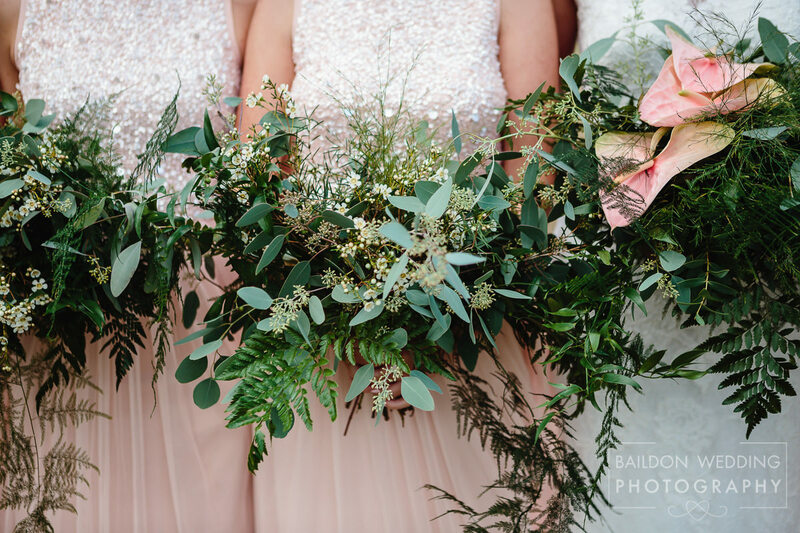 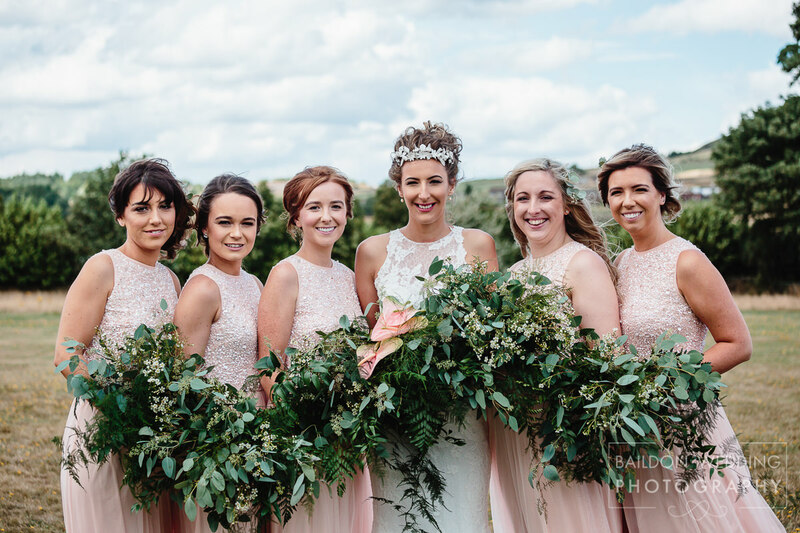 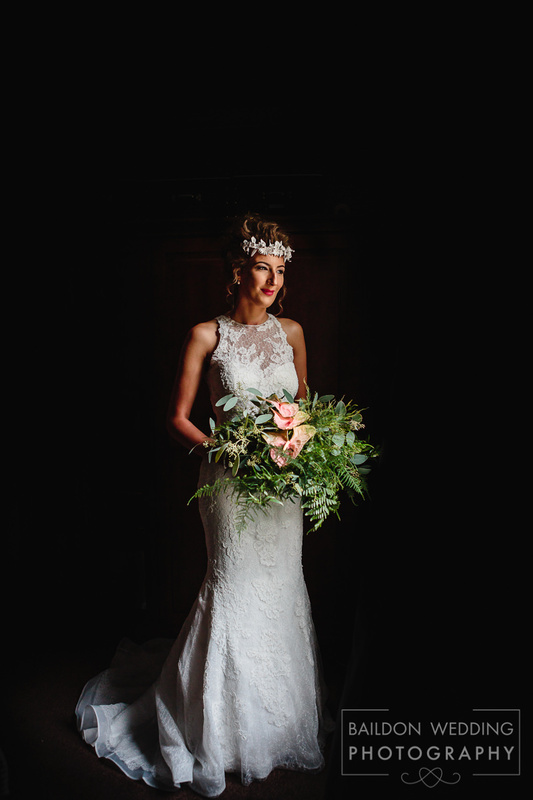 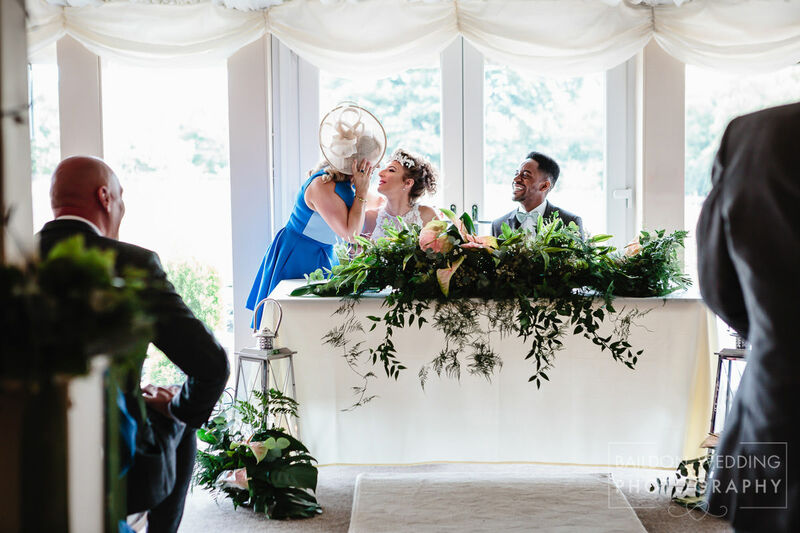 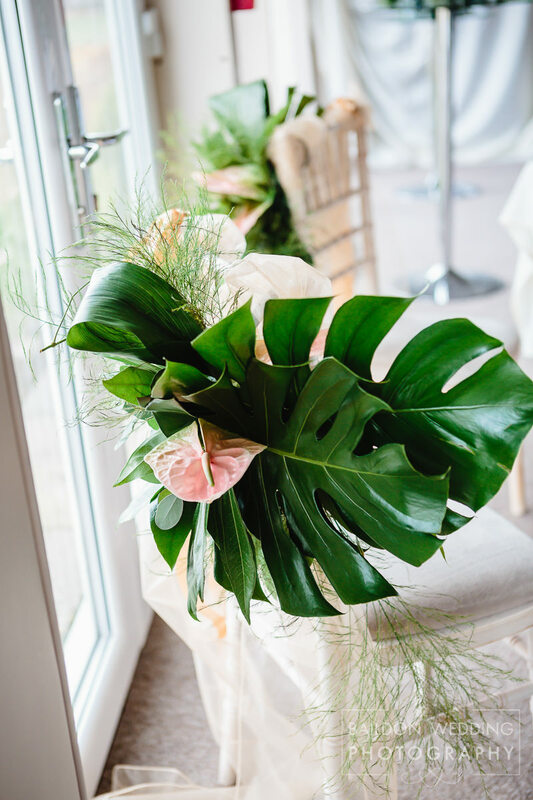 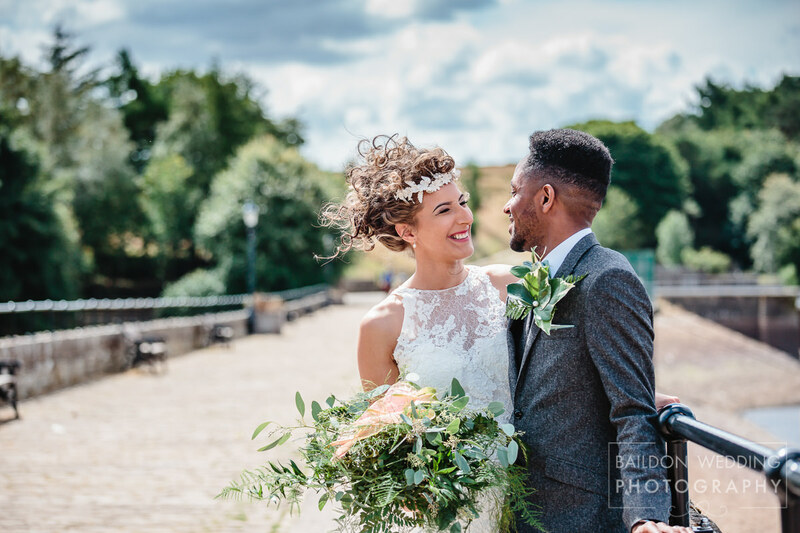 She decorated the venue and made the bouquets with a selection of foliage, reflecting William’s Caribbean roots through the use of exotic leaves. 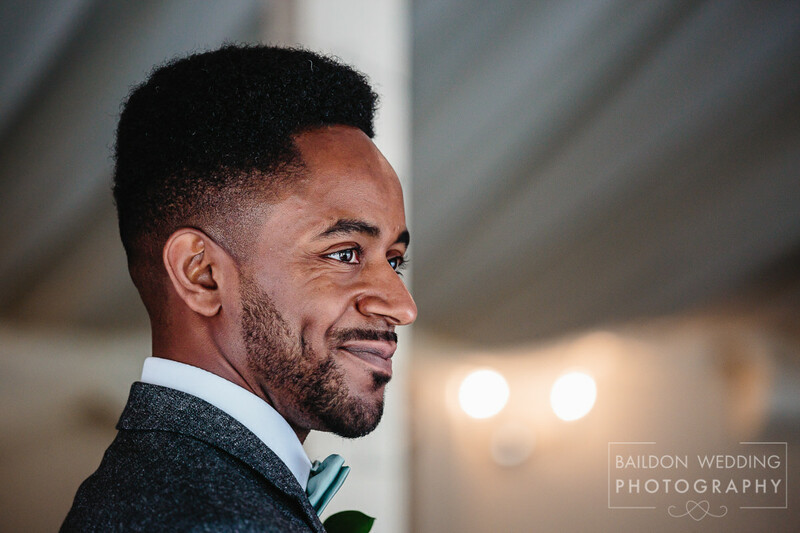 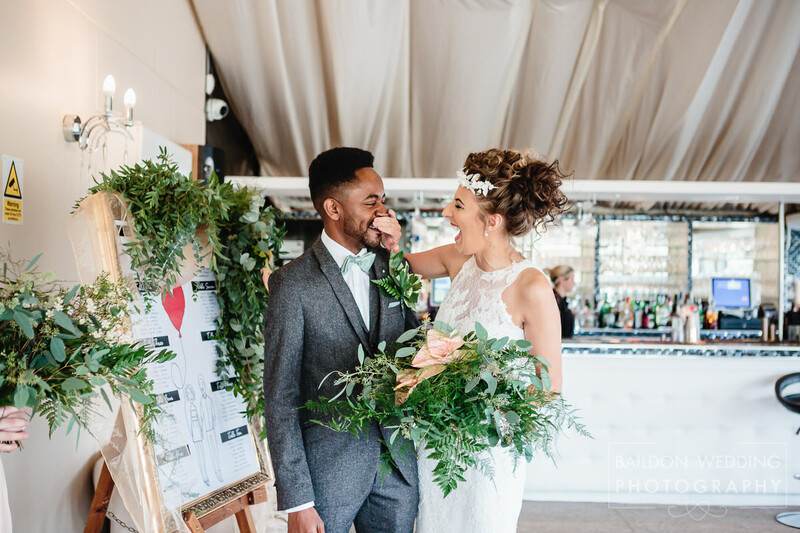 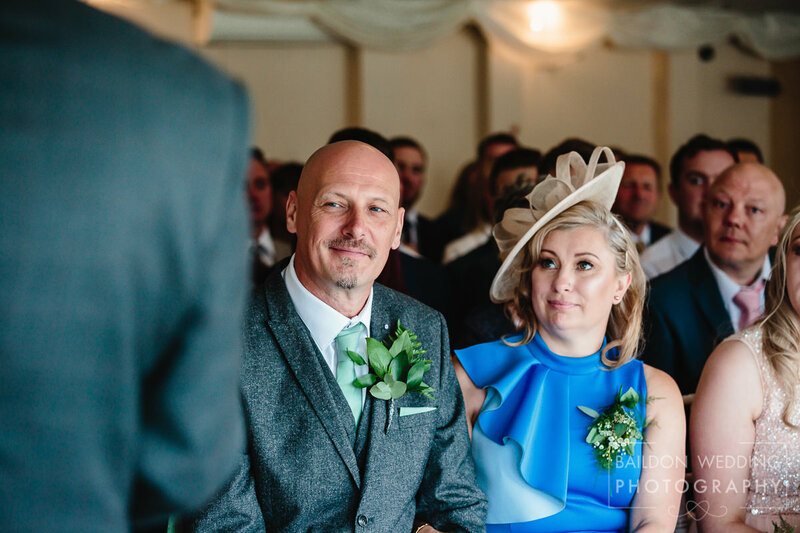 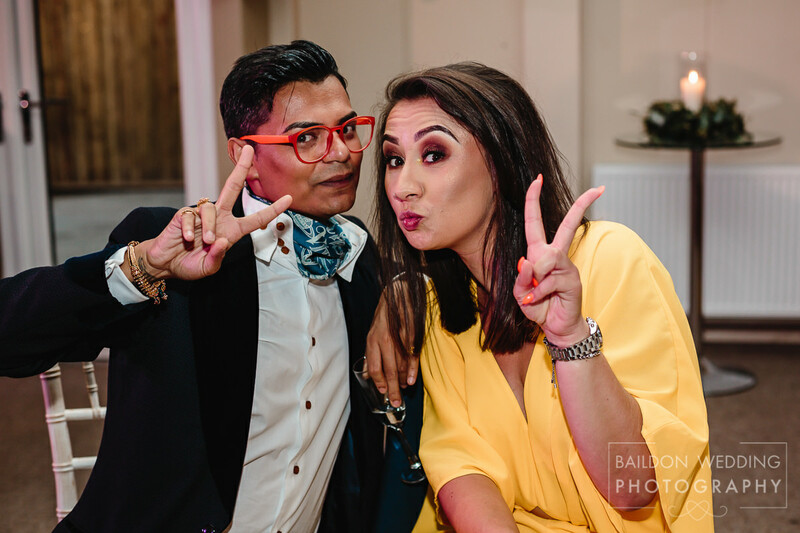 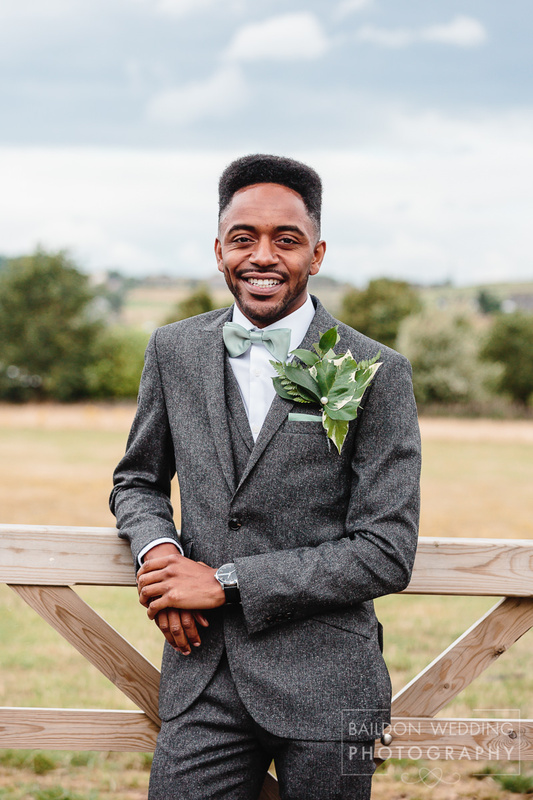 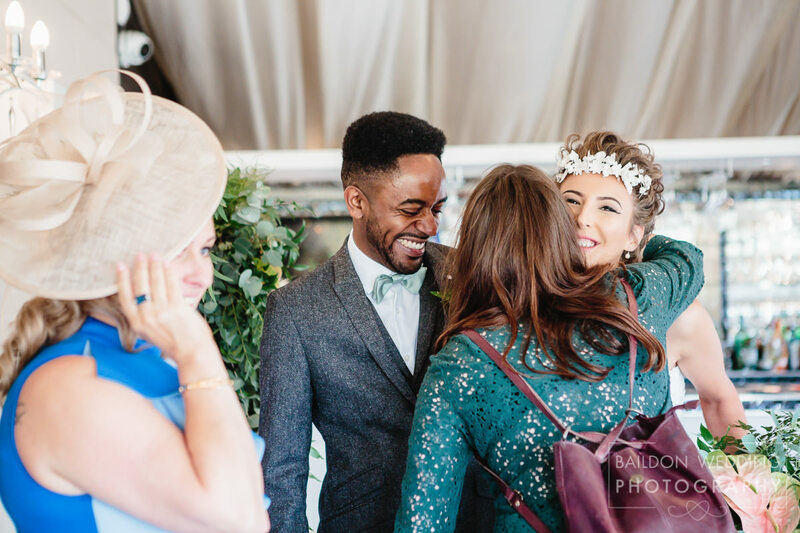 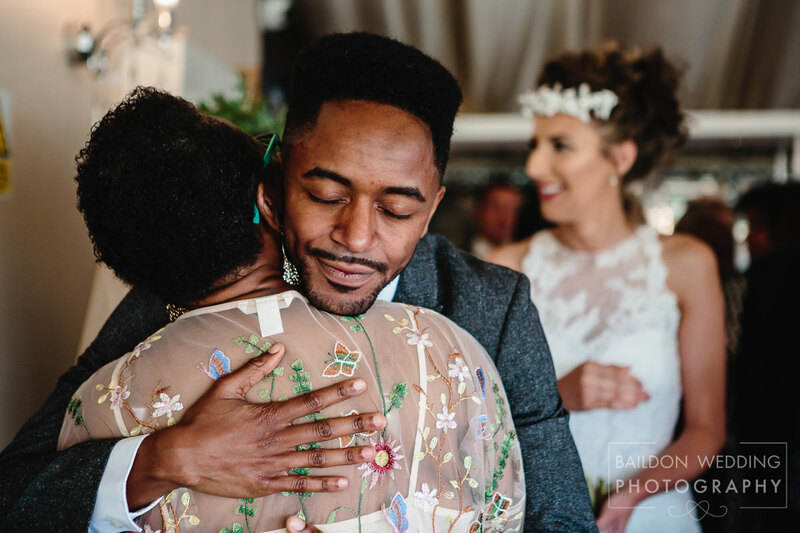 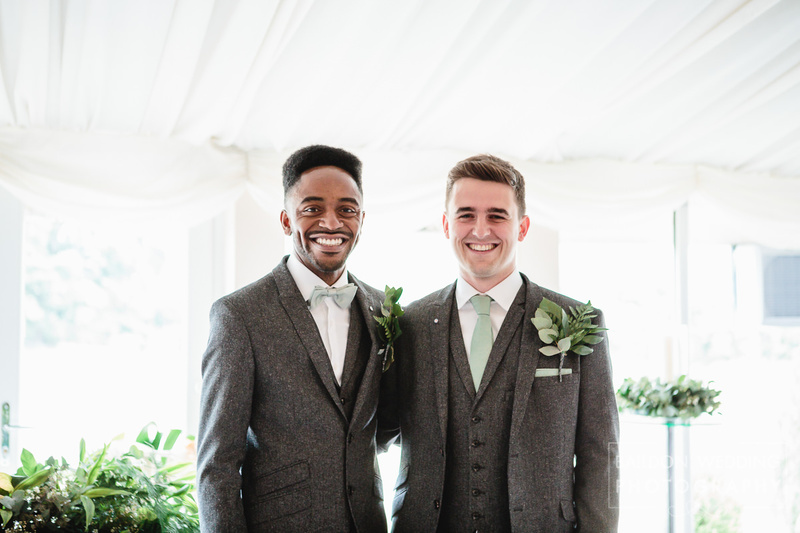 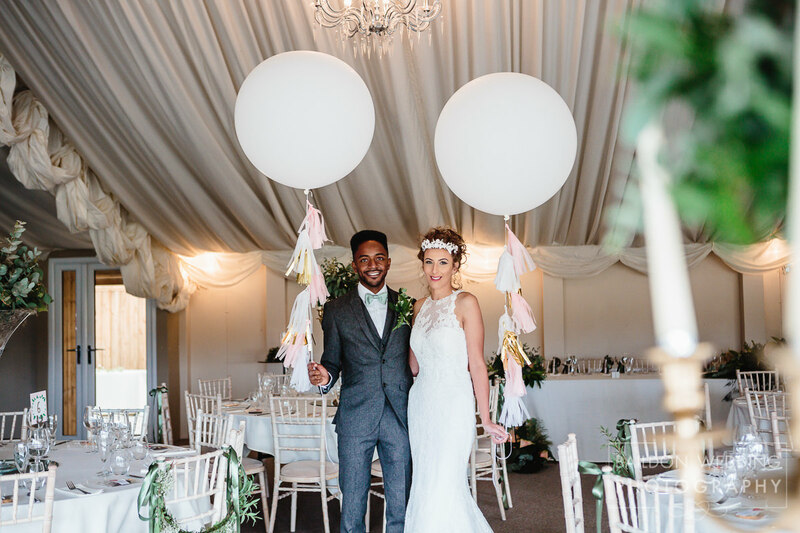 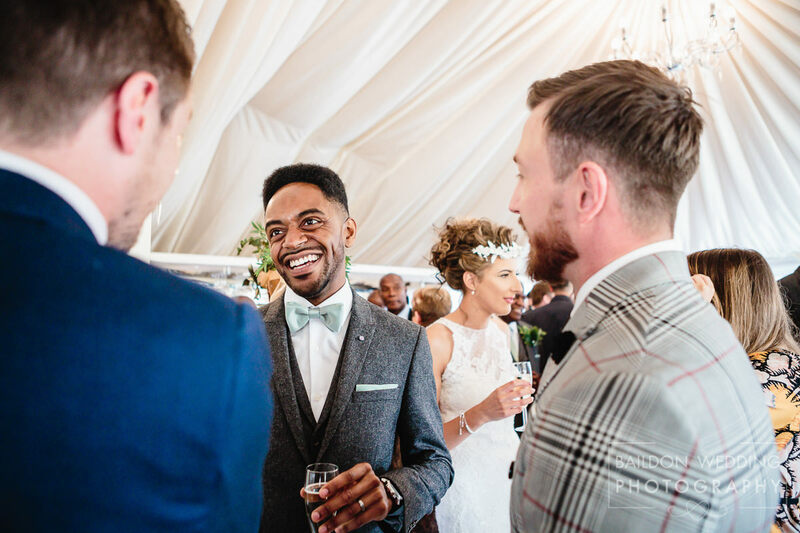 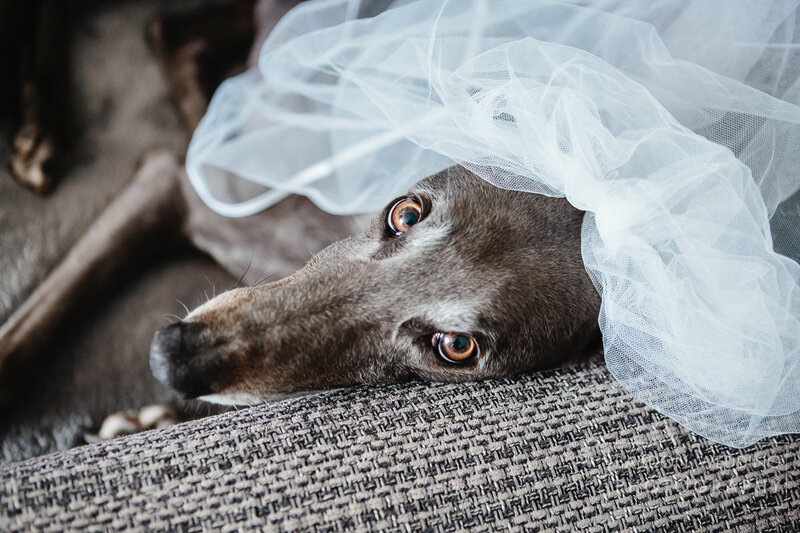 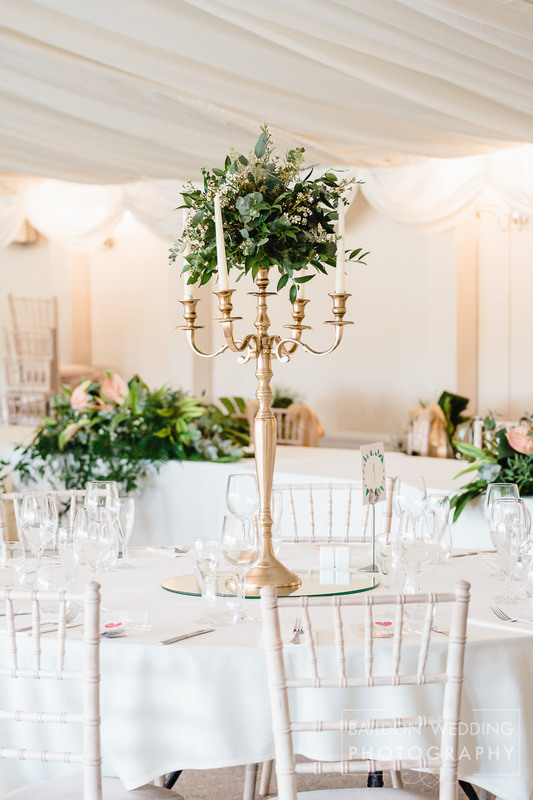 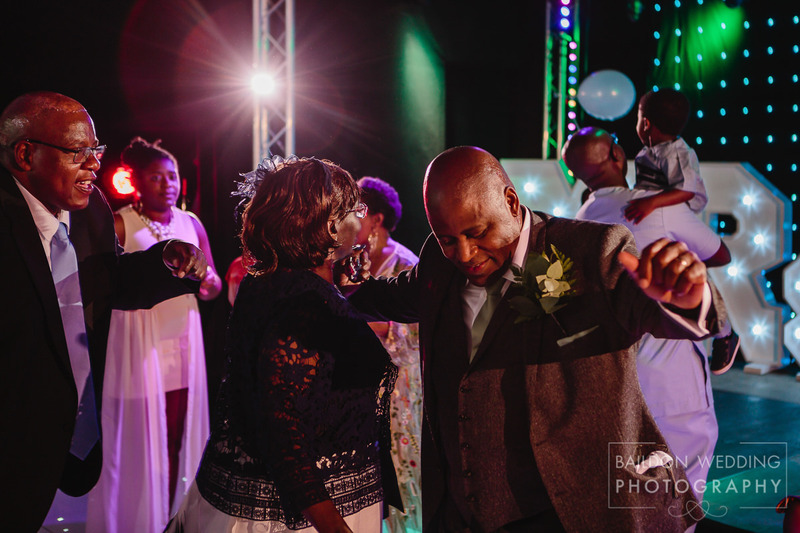 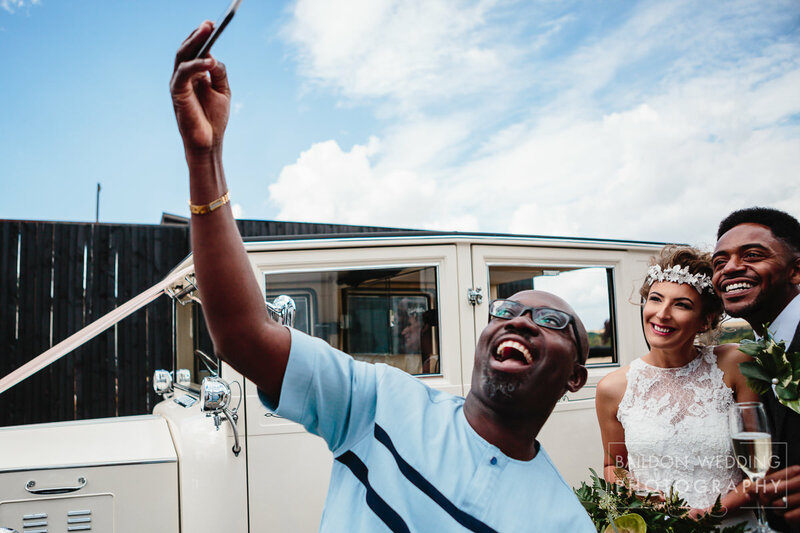 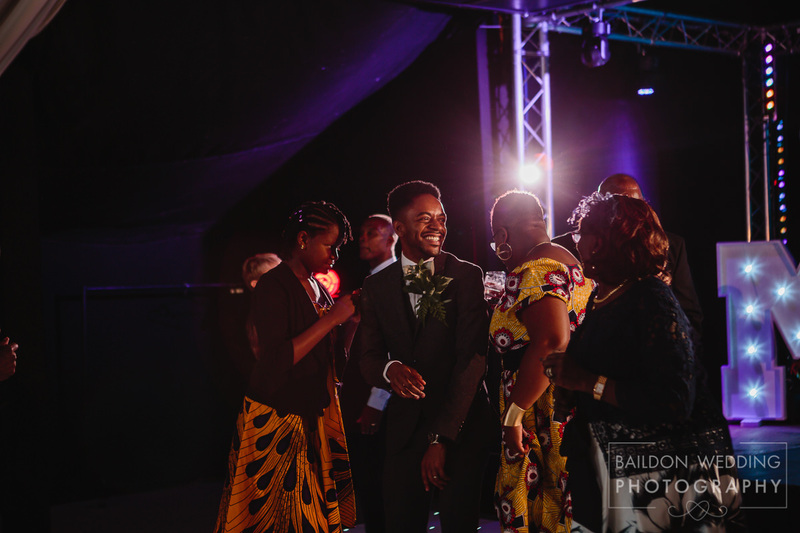 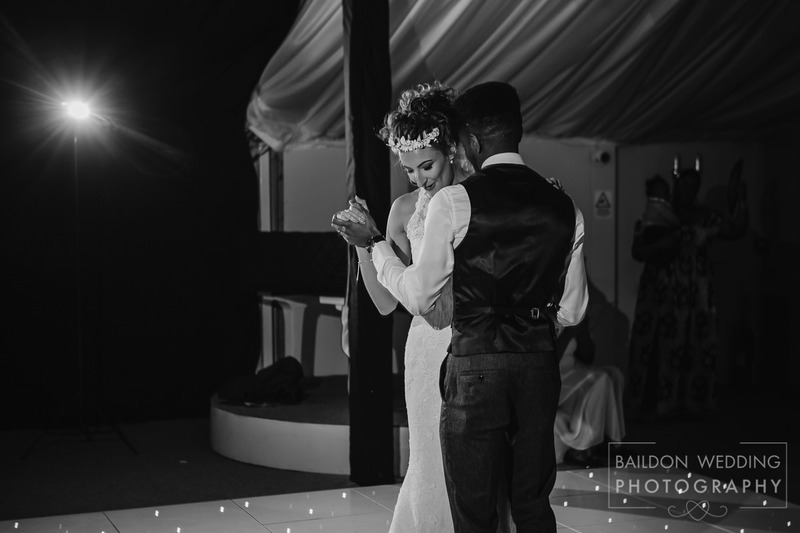 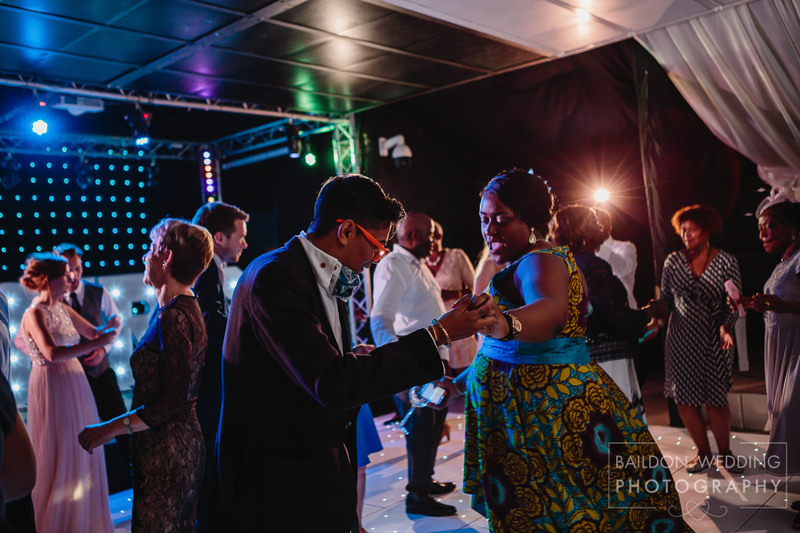 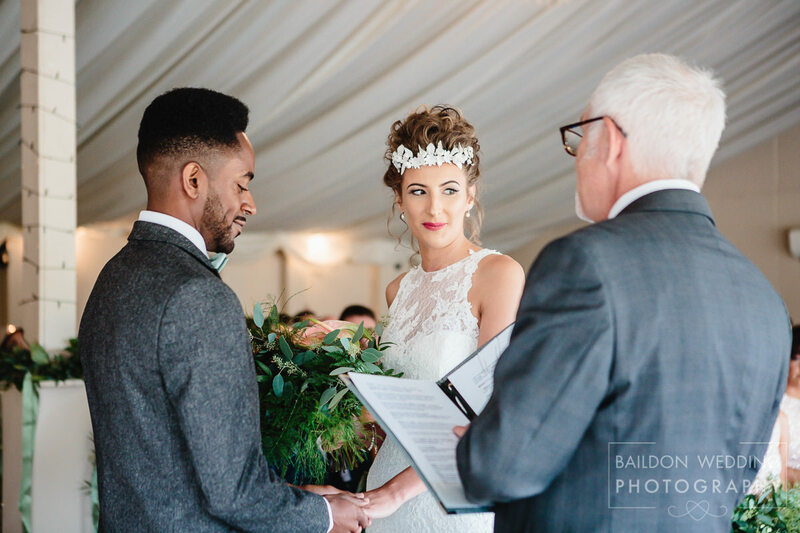 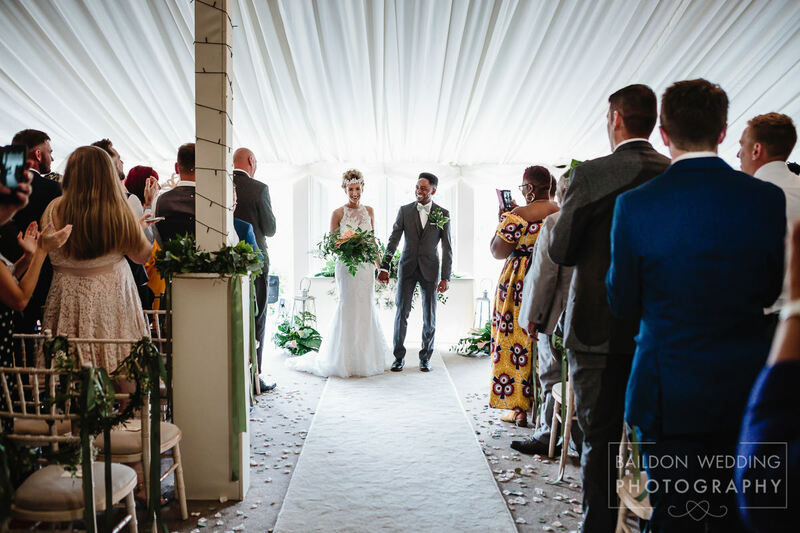 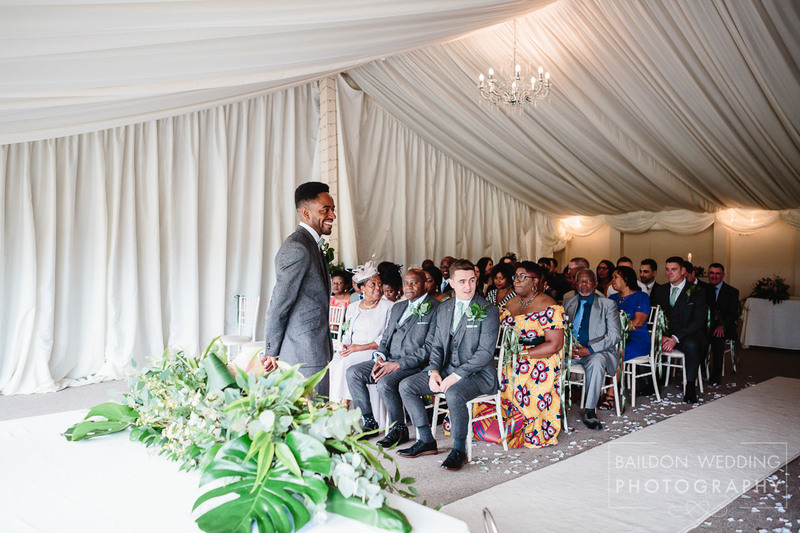 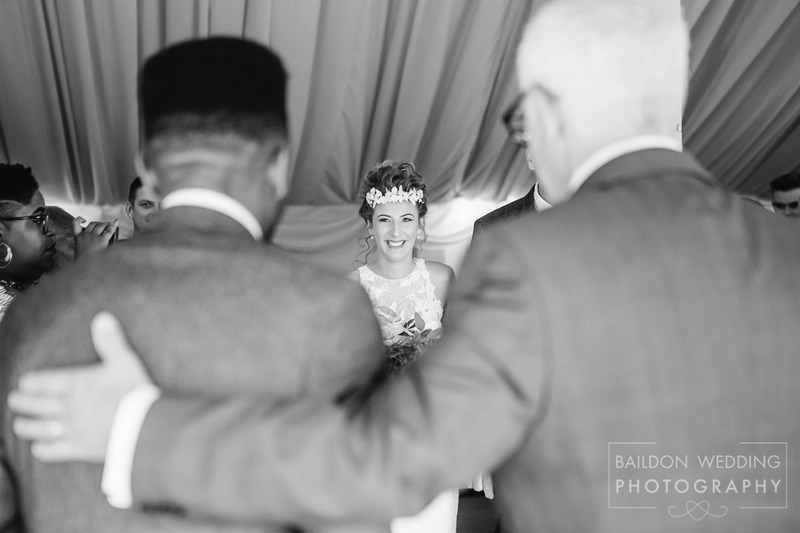 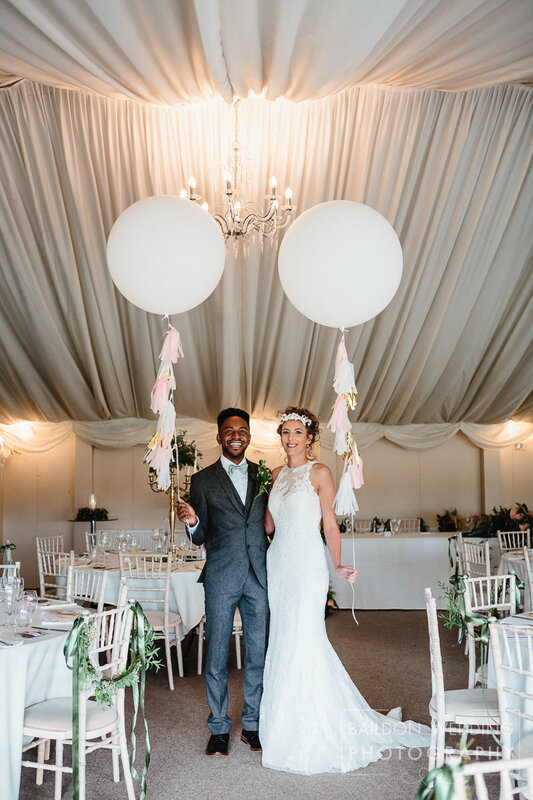 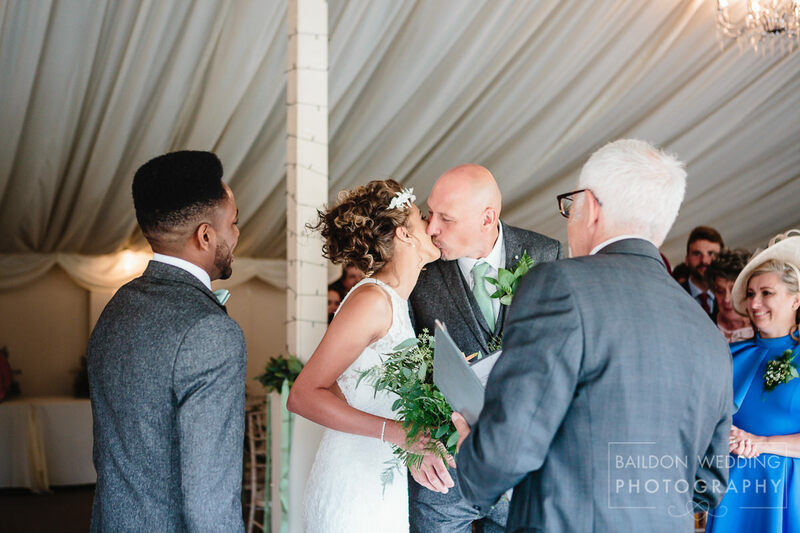 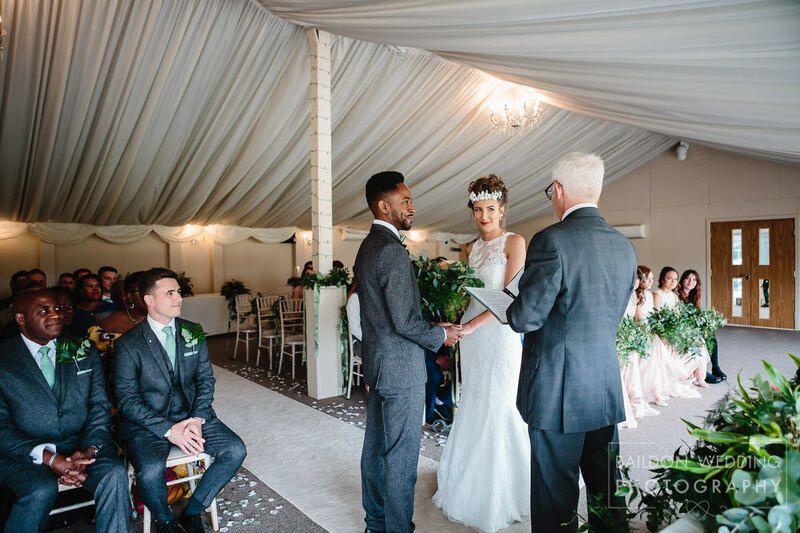 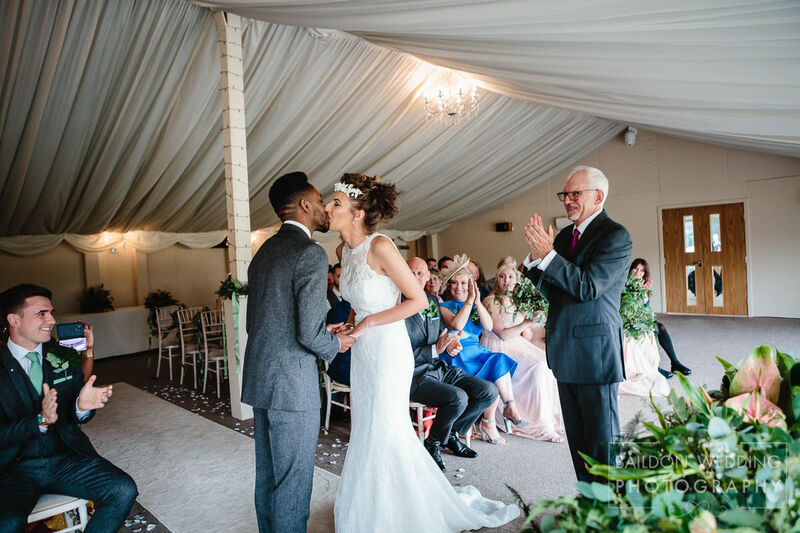 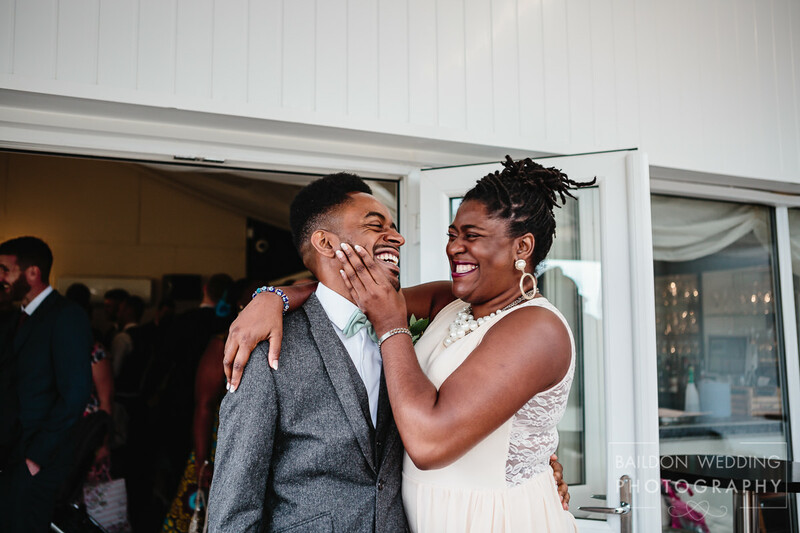 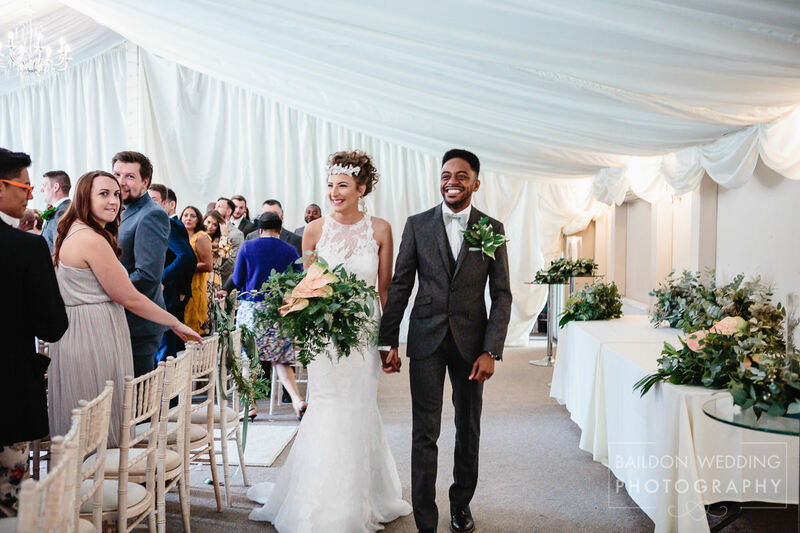 The civil ceremony took place in the elegant marquee, where William was awaiting his bride’s arrival and didn’t stop smiling once she walked down the aisle. 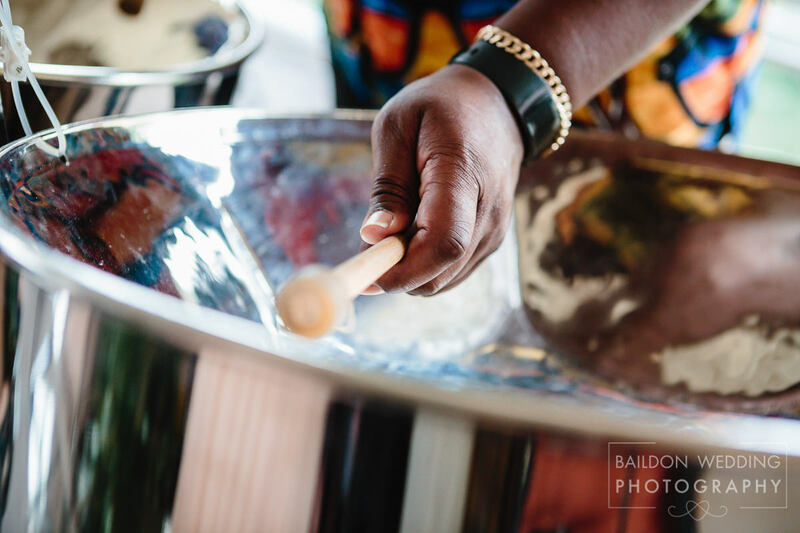 After the ceremony, Steel Drum Bands played and were absolutely fantastic. 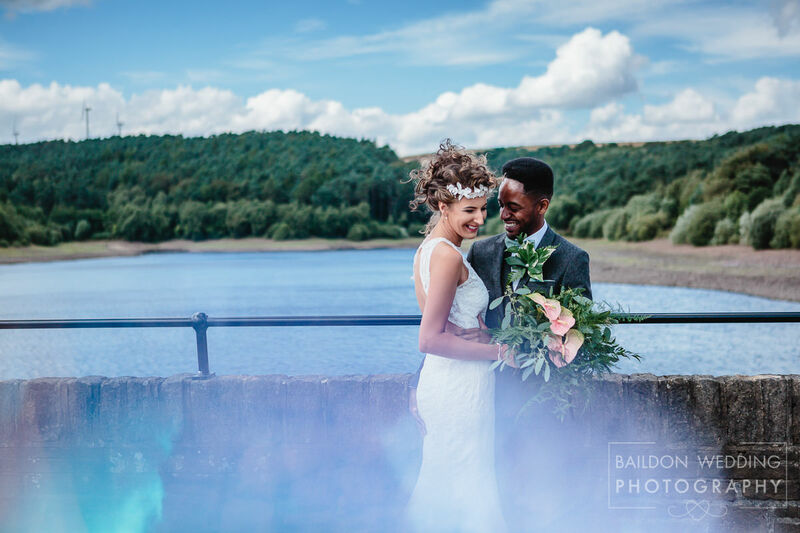 Rain was forecast throughout the day, so we took the opportunity for couple portraits at the nearby Ogden water soon after the ceremony. 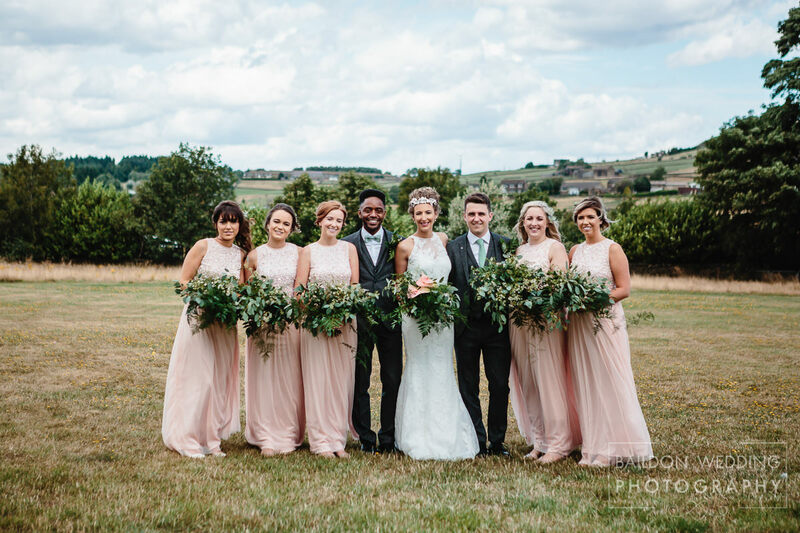 This was swiftly followed by group shots on our return to Moorlands, narrowly avoiding a downpour! 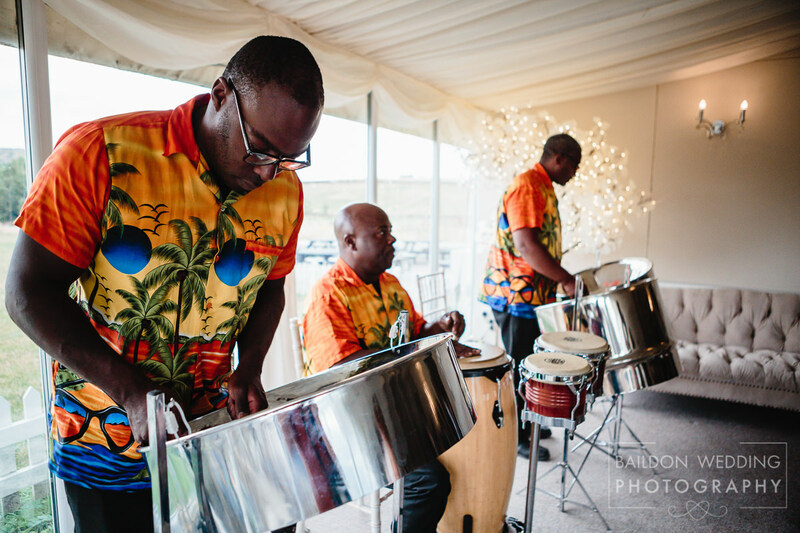 The steel band kept the entertainment flowing as the guests enjoyed the Caribbean inspired BBQ. 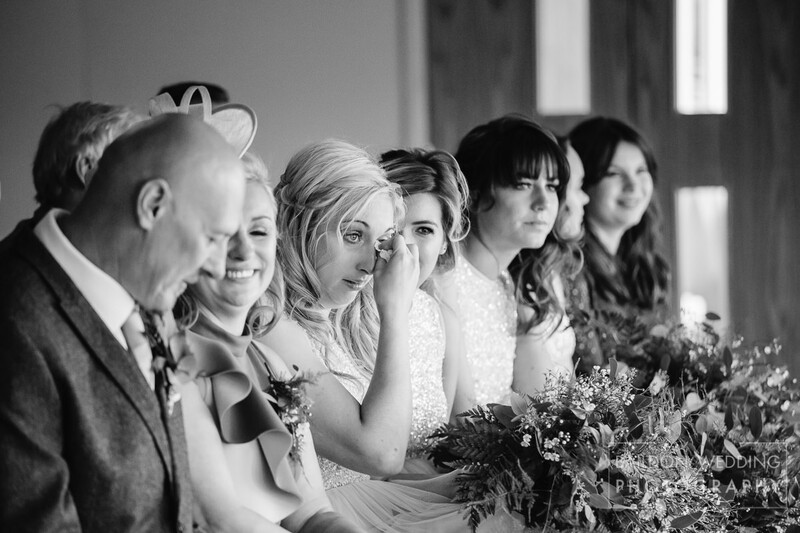 After the meal was the speeches. 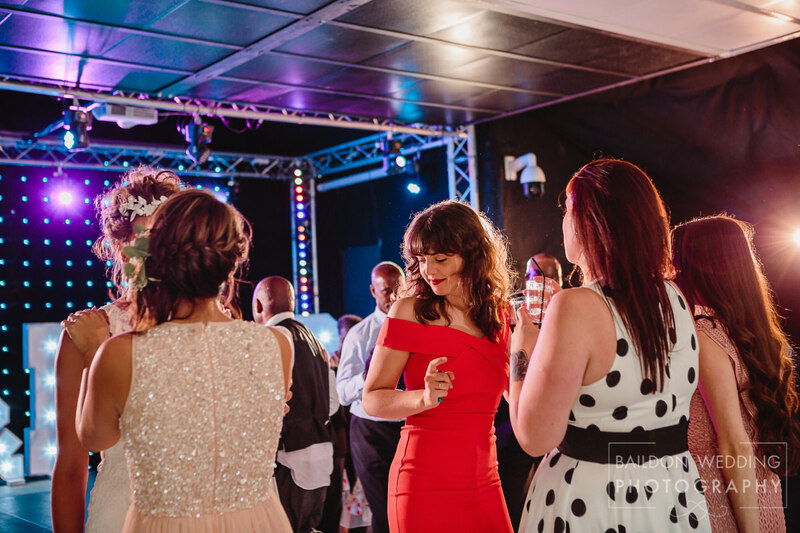 The party was in full swing at the evening reception with lots of dancing. 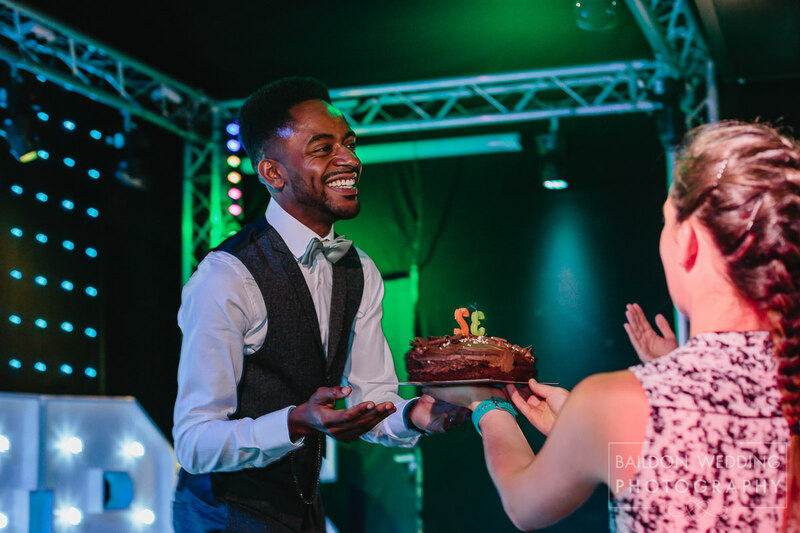 For Groom, William’s birthday (an anniversary date he can never forget), he was presented with a birthday cake after the first dance. 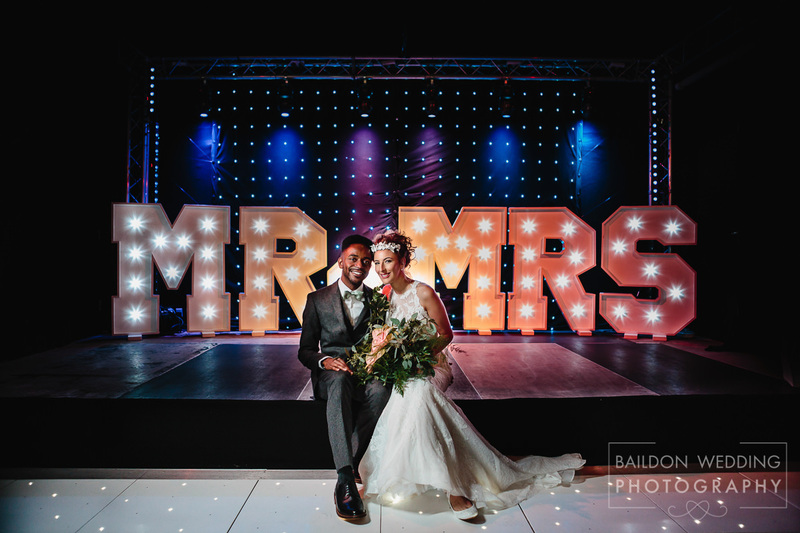 It was an absolute belter of a wedding, huge congratulations Mr and Mrs C! 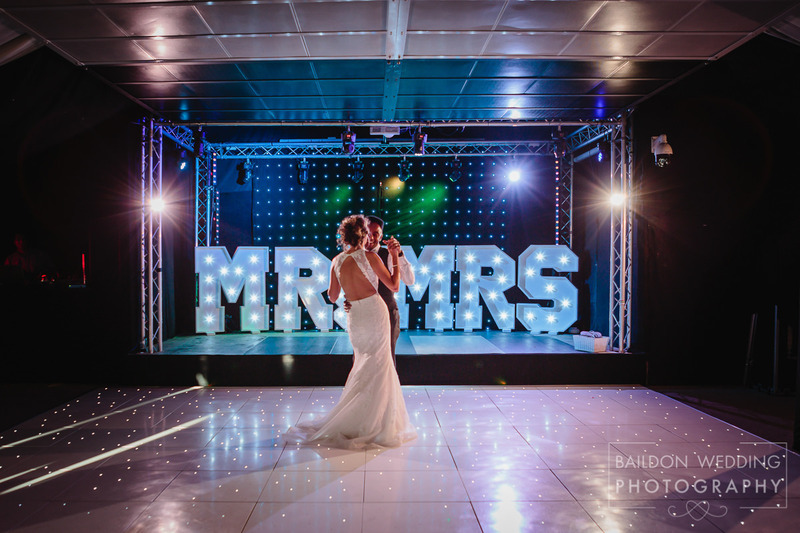 This is a fantastic venue for a wedding, I hope to return to Moorlands Inn Halifax wedding venue very soon.